Europe is home to many amazing historical landmarks, architectural masterpieces and of course, possesses a rich cultural heritage unlike anywhere else in the world. One of the best ways to appreciate and better understand this amazing continent is to explore the diverse blend of castles, each with their own unique story and impact on the nation they reside. When it comes to the best castles in Europe, well it’s a tough decision because there are so many amazing ones to choose from. 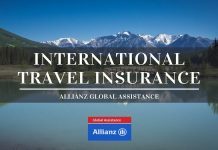 Whether you are experiencing historic Windsor Castle or York Castle in England or the picture perfect Neuschwanstein Castle in Germany, you can be sure that Europe is home to an amazing collection of breathtaking landmarks. Thanks to many of our amazing friends around the world, we are delighted to put together one of the most in-depth guides to historic castles across Europe. 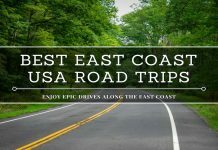 This is certainly not an exhaustive list of all the castles and I am quite sure there are plenty of others that should have made this guide but for those of you interested in developing an itinerary to travel Europe to explore these epic landmarks, hopefully, this guide is a great starting point. To make life a little easier, here is an interactive guide to all of the castles featured in this post. 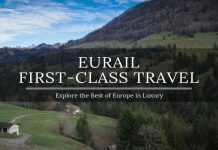 As you can see, there is a pretty epic road trip or Eurail train journey to be experienced here if you want to check out all 50 (and likely stumble across many others along the way!) castles. Please feel free to comment at the bottom of this post with your favorite castles and particularly share your recommendations on which others should be added to this list…but for now, please sit back and enjoy the collection of European castles that will leave you in awe through their architectural beauty, lavish designs and all the amazing stories surrounding them. Check out the following table of contents to make life a little easier in navigating to your favorite castle(s) and below each castle is a “Return to Table of Contents” link so you can pick and choose which castles you want to explore…or of course, become an expert on all 50 of them! St George Castle dominates the horizon of the Lisbon city center in Portugal. 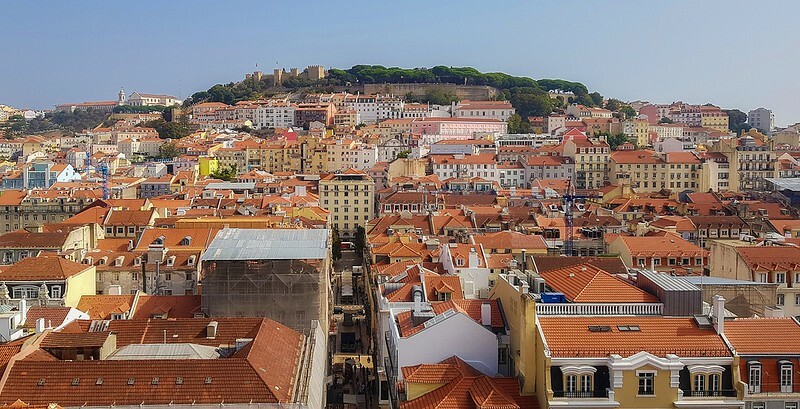 Castelo St George sits atop one of the seven hills in a commanding position looking over the old Lisbon downtown area. Lisbon monuments such as Rua Augusta Arch sit below you at the bottom of the hill. The original settlement on this site in Lisbon city center dates back to 48BC. Castelo St George has been in place since the 6th century when it was fortified by Roman Visigoths and eventually the Moors used it as a Royal seat of residence until the 11th century. Did you know Lisbon is older than Rome? Today, Castelo St George welcomes tourist on mass as they make there way up the hill to the gate. Visitors will be rewarded with one of, if not the best viewpoint in Lisbon. The outer walls let you view Lisbon in a 180-degree arc. Say hello to the statue King Afonso in the adjacent courtyard seemingly still overlooking his royal palace. Further exploration will find the remains of the Alcaçovas Palace complex where you can walk the walls, and an archaeological museum to discover artifacts found on site. Castelo st George should be one of your first stops when visiting Lisbon. The castle in Lancut is the best that we have ever been to! Why? Because it has everything that you can possibly expect from the beautiful landmark: amazing interiors and stunning architecture. It was built in the 17th century and belonged to Lubomirski and Potocki families. Lancut Castle is surrounded by the park, so after sightseeing, you can just walk around and relax. Lancut is a lovely little town located just 2 hours driving from Krakow. If you decide to go there, be sure to visit not only the castle but also the carriage house. It has one of the largest collection of horse-drawn carriages in the world. 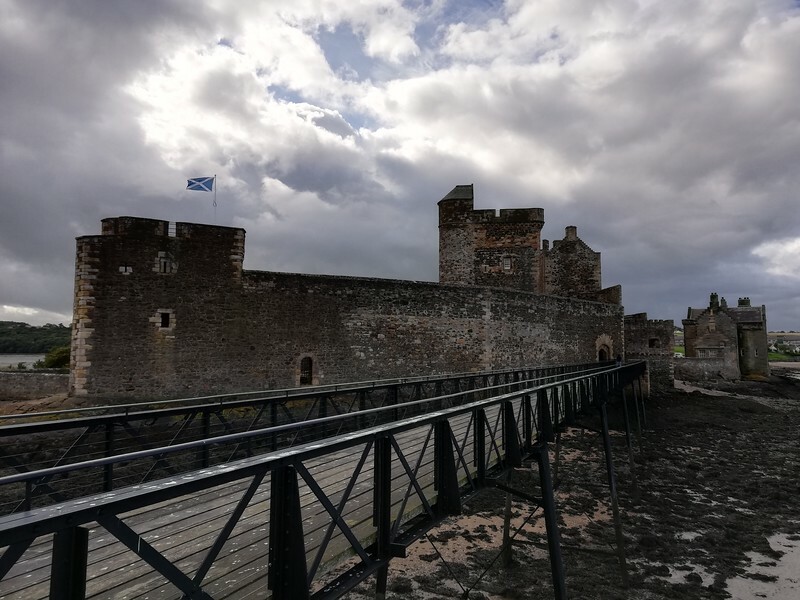 Blackness Castle is one of the best castles you can experience in Scotland. It is very close to Edinburgh, making it extremely easy to visit. It sits on the shores of the Firth of Forth, in a small town called Blackness. The castle has a wonderful history and was actually featured in the Outlander TV series. We visited on a cold, breezy day. We loved that they offered coffee in the little ticket store, and they even gave an explorer pack for our son to use during his visit. This had knight toys, a jester hat and many other little things for him to keep himself amused with during our visit. One of the rooms of the castle had shield boards and rope hoops to play a tossing game. Blackness Castle is shaped like a ship and is also known as the ship that never sailed. 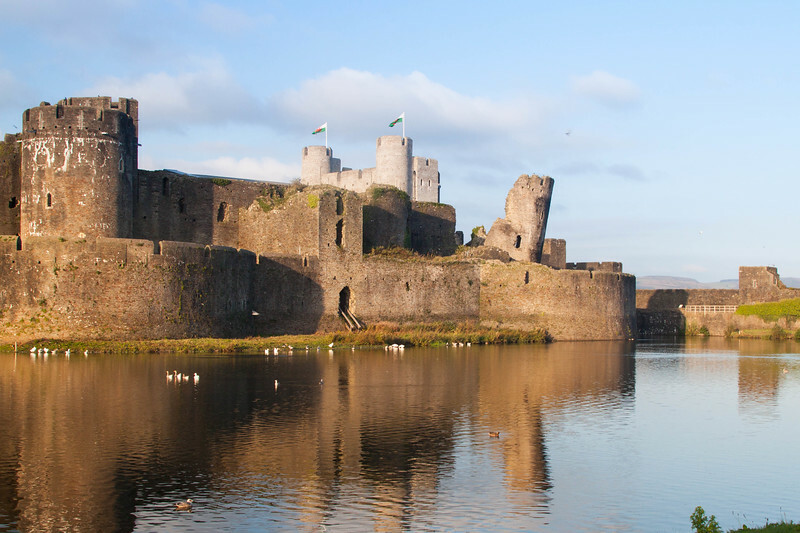 Caerphilly Castle, in Wales, is one of the best castles in Europe. As the second largest castle in Britain, it not only has a rich history since it was built in the late 1200’s, it also has a tower dubbed “The Leaning Tower of Wales”. The medieval castle’s south-east tower leans to a greater degree than the leaning tower of Pisa, the result of both damage and subsidence. 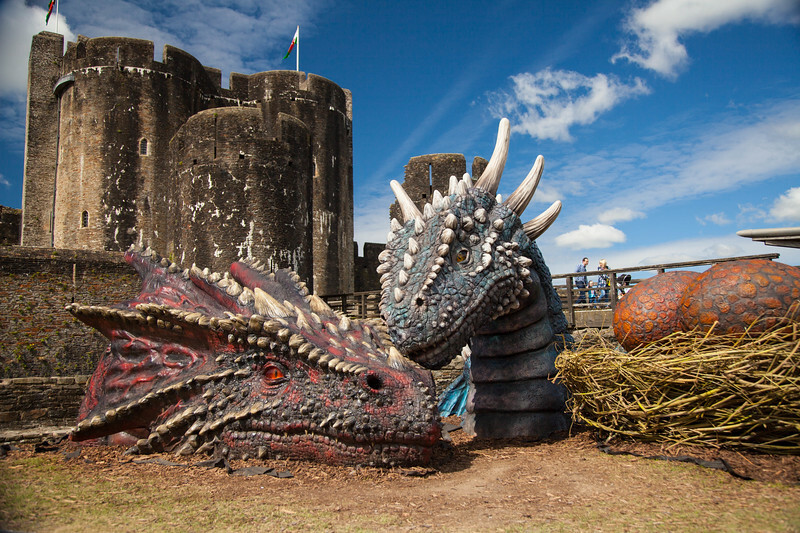 In 2016 a dragon appeared on the banks of the castle and promptly moved inside. Dewi was joined by the very beautiful Dwynwen and they have since had two babies. 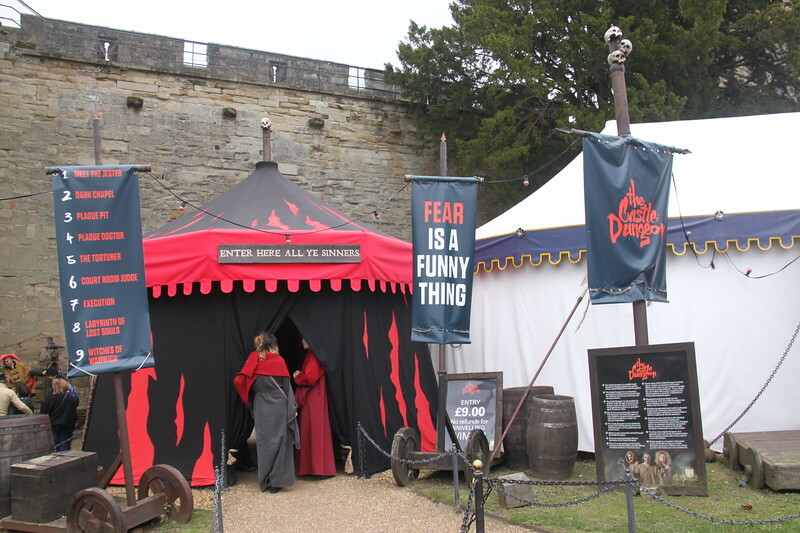 There are many rooms and areas to explore in this castle and in the summer of 2018 a new attraction called the Dragon’s Lair was added to delight visitors of all ages. It’s a must-see castle in South Wales. The Loire Valley in France showcases an abundance of stunningly ornate castles (or rather châteaux). One of our favorites has to be Château de Cheverny. I could say that it is because of the grand entrance, the exquisite artifacts oozing with history, or the perfect garden views. But with this chateau, it’s actually its quirks and extra activities it offers to the public. Whether it be jazz in the gardens, a murder mystery tour, or the visually engaging Tin Tin museum, there’s something for everyone. As we were visiting the Loire with kids, this chateau is a particular favorite as our boys loved watching the hounds being fed (every day at 11:30 am), before finding the LEGO structures hidden around the rooms of the chateau’s interior. Ensure you take a picnic to enjoy down by the river and if you manage to find your way out of the maze, reward yourselves to some delicious home-made ice-cream at Cafe de l’Orangerie. In central Sweden, about 200 kilometers west of the capital Stockholm, you’ll find the small town of Örebro. The town is not one of the most well known in Sweden, but it’s known for one thing in particular – its beautiful 800-year-old castle. 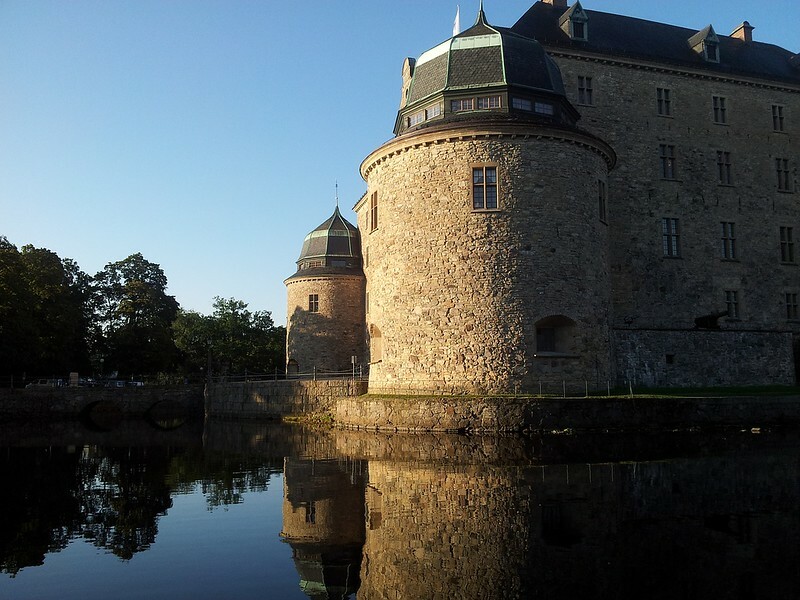 Örebro Castle is a beautiful old-fashioned castle, situated on a small islet in the middle of the river Svartån. Many historic events have taken place here, making it a special place in Swedish history. Why not take a stroll along the river, sit down for a cup of coffee at one of the cafés or have dinner overlooking the old town as the sun sets? 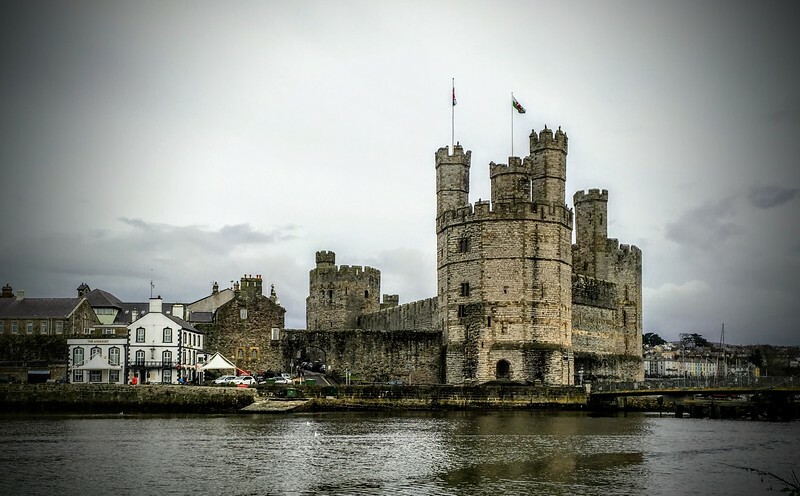 Caernarfon Castle, built by Edward I following a successful charge across North Wales, is a wonderland of turrets, towers and magnificent gates. The King wasted no time in marking the castles significance with the birth of his 4th son who would become the first Prince of Wales and go on to reign England as Edward II. King Edward had the walls built in bands of different colored stones – a nod to Constantinople – which intended to show strength. The huge towers which surround the inner courtyard are polygonal in shape and are unique in Edwardian castles. 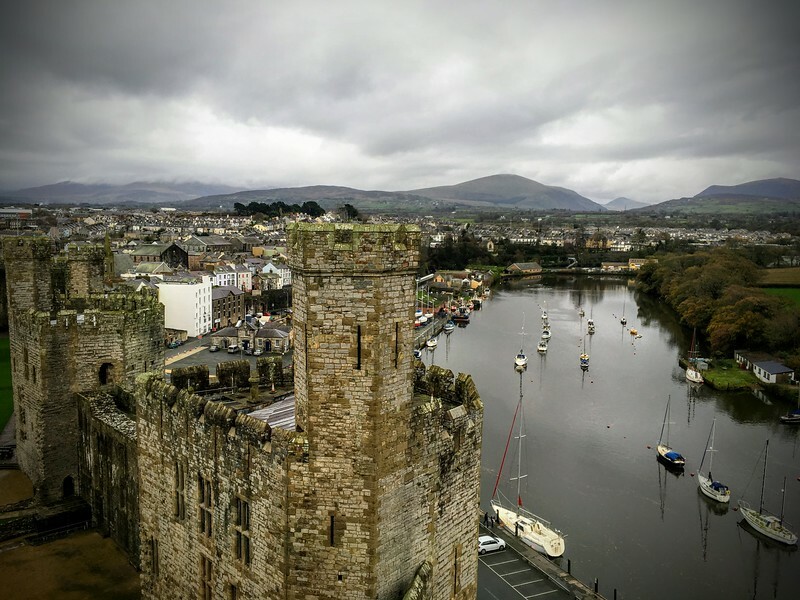 The Eagle Tower, with its three polygonal towers sprouting from it, is the jewel in Caernarfon Castles crown. It’s a long climb up a narrowing stairway but the views from this most westerly point of the castle are amazing. Anglesey beyond the Menai Straights to the North-West and Snowdonia National Park to the South-East. Hluboka Castle is probably one of the most fascinating castles in the Czech Republic. The white marble walls create the perfect picture scene both during the day and at night when it gets illuminated. If you like waking up early in the morning, you might witness the ascension of hot air balloons on the background, fully enhancing the fairytale feel. 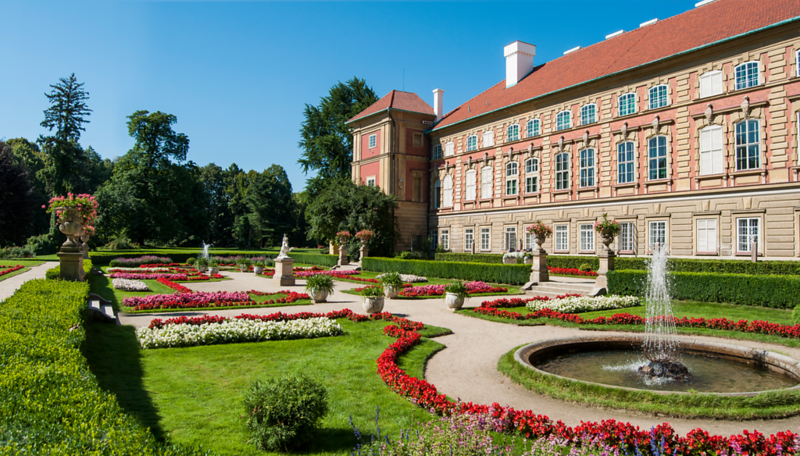 This Renaissance castle with Baroque elements is big in itself, but it is also surrounded by a vast garden with flowers and fountains that will make for a great picnic spot as well. Besides taking a tour inside the castle, you can stop for lunch or dinner at the restaurant in the chateau which is a 4-minute walk from Hluboka Castle. Hluboka Castle is situated in the South Bohemia region, only 10 km away from Ceske Budejovice, the region’s capital. In the midst of the French countryside on the Spanish border lays a tiny town with an important historical significance. 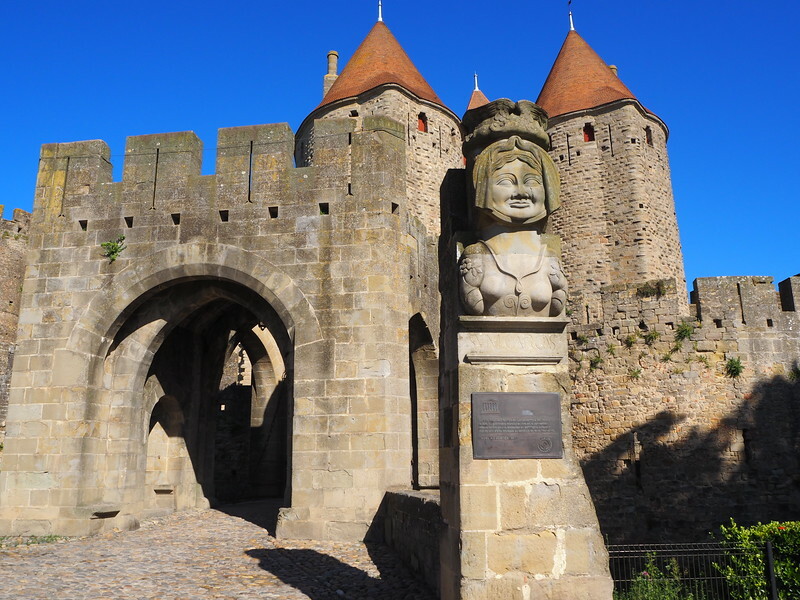 Meet Carcassonne – a home of the largest fortified city in Europe. 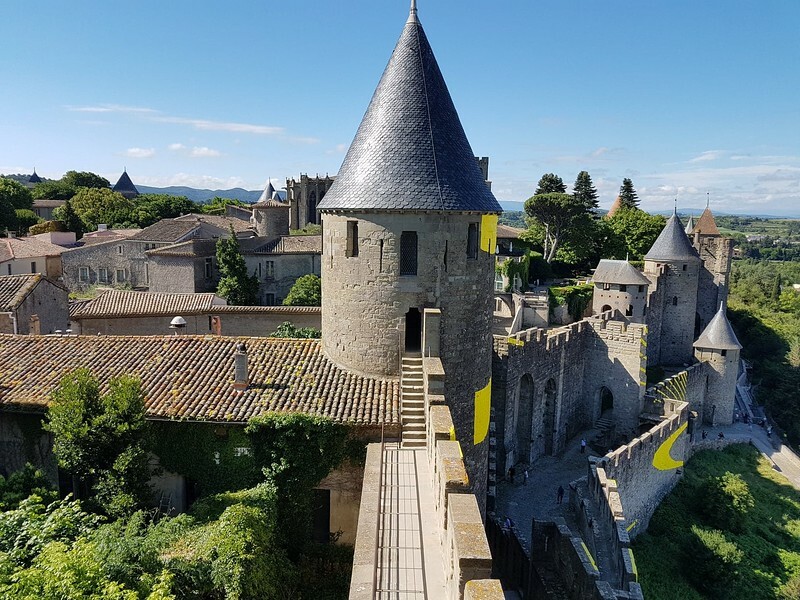 Its citadel, the Cite de Carcassonne, is a medieval fortress dating back to 12th century of the Gallo-Roman period. Importantly, it has been added to the UNESCO list of the World Heritage Sites. The uniqueness of this place lays in its restoration process carried out in the second half of the 19th century. 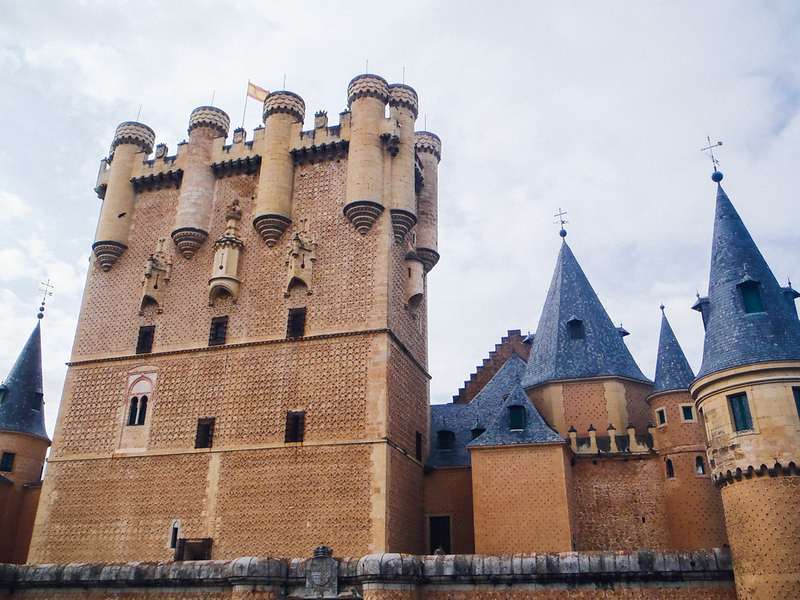 The magnitude of the fortress with its fairytale collections of towers, drawbridges, artifacts, and atmospheric cobbled streets left us speechless. The unforgettable experience of walking along the fortress’ walls with the panoramic 360C view of the city as well as the view of the castle from the distance are the memories we will cherish forever. 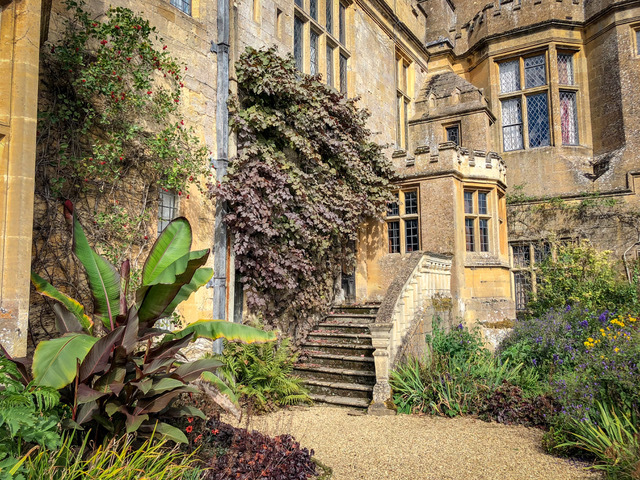 Sudeley Castle sits amid 1200 acres in the honey-stoned Cotswolds, just dripping with English Royal History. King Henry VIII’s sixth wife, the only one to survive him, lies buried in the beautiful 15th-century church and Queens Anne Boleyn, Elizabeth I and Lady Jane Grey also visited here. Yet today it’s also a private home, providing a curious mix of pageantry and personal life (and a pheasantry with 16 rare and endangered species.) You can sip afternoon tea, let children run through the adventure playground and stroll through crumbling ruins and immaculately preserved halls. All within one place and that’s why I love it so much: within the grounds of Sudeley Castle. One of our favorite castles in Europe is the “Othello Castle” located in Famagusta on the Northern occupied part of Cyprus. We love Famagusta generally because this is where Stefan’s family all originate from. So coming here is always an important discovery trip for Stefan. We particularly love the Othello Castle because it is located in the gorgeous Famagusta Old town, which is rich with history dating back to the Romans. Othello Castle was built in the 14th century by the Lusignans to protect the port against possible enemy attacks. 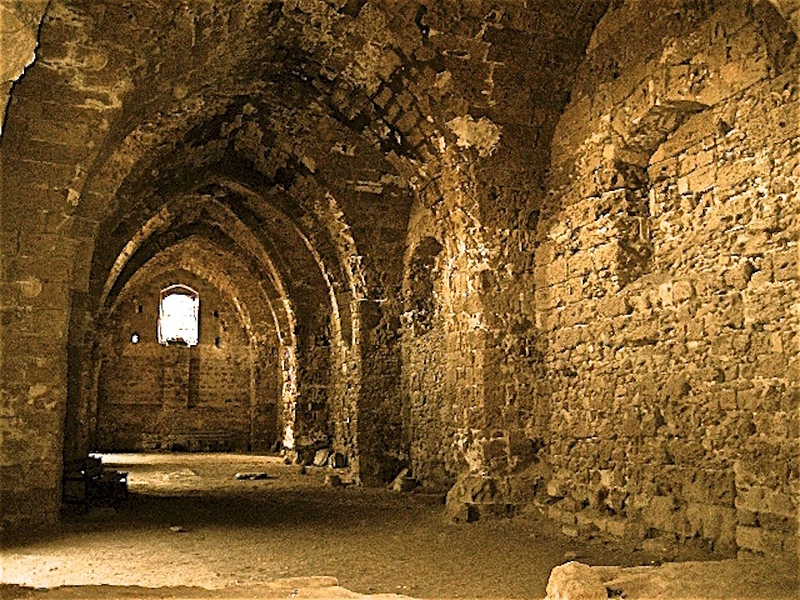 It was also used as the main entrance to the walled town of Famagusta. 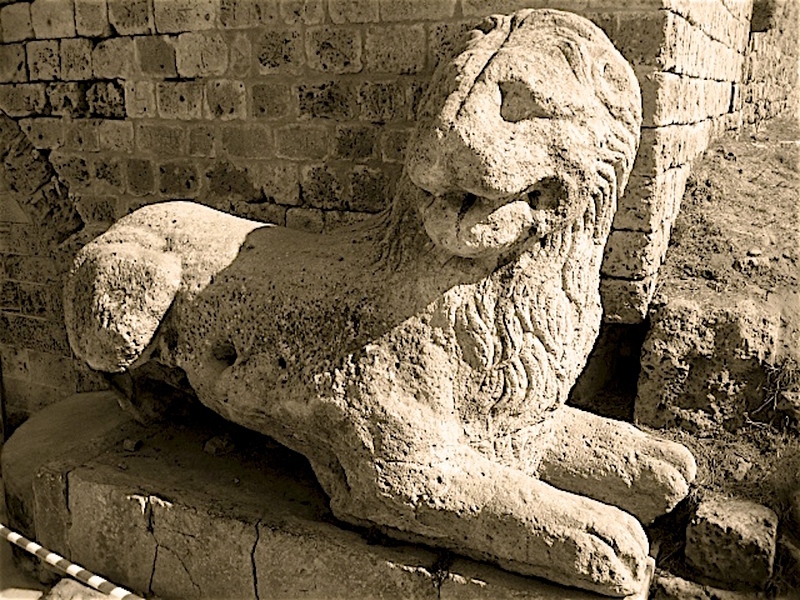 It was later sold to the Republic of Venice who added the iconic relief of the Lion of St Mark. It was during this period when it got its name and has been romanticized. Shakespeare’s play “Othello” was written in around 1603 and was believed to be set here. 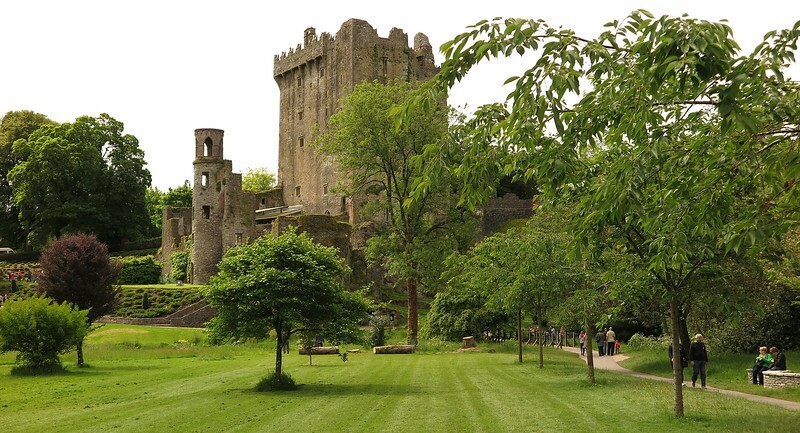 The most well-known castle in Ireland is probably Blarney Castle, site of the kissable Blarney Stone that Ireland is famous for. The castle is surrounded by beautiful grounds but the structure itself is just a shell. 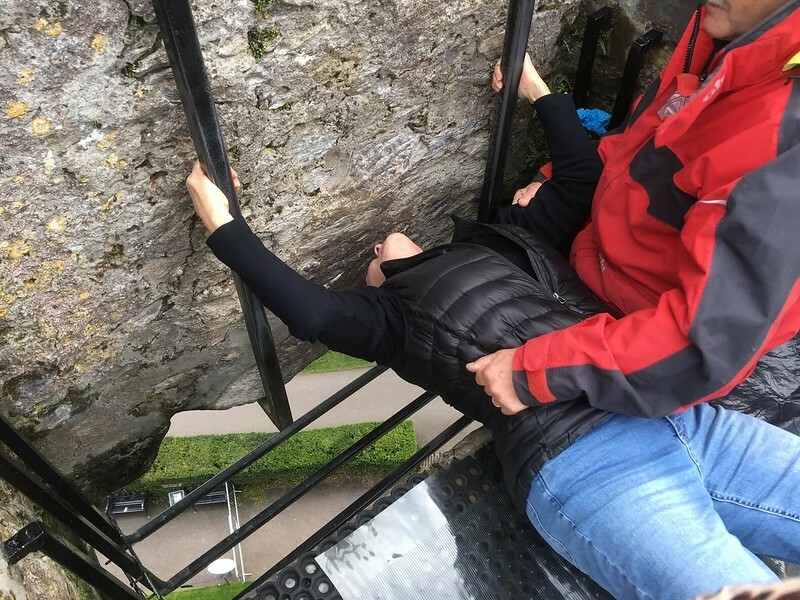 The legend is that if you kiss the Blarney Stone you will be granted the gift of gab or you will become eloquent. Depending on your tolerance for silly touristy gimmicks you may or may not feel compelled to visit Blarney Castle and kiss the stone. 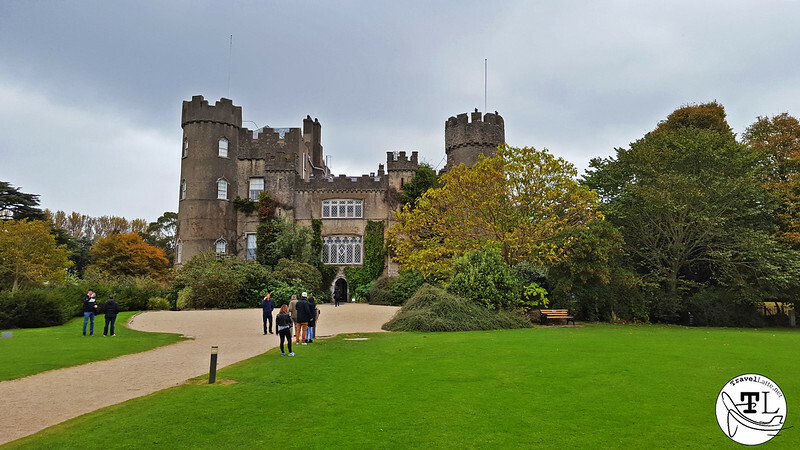 It is possible to visit the castle on a day trip from Dublin, but it is better to schedule a stop on your way to or from Ireland’s spectacular west coast. 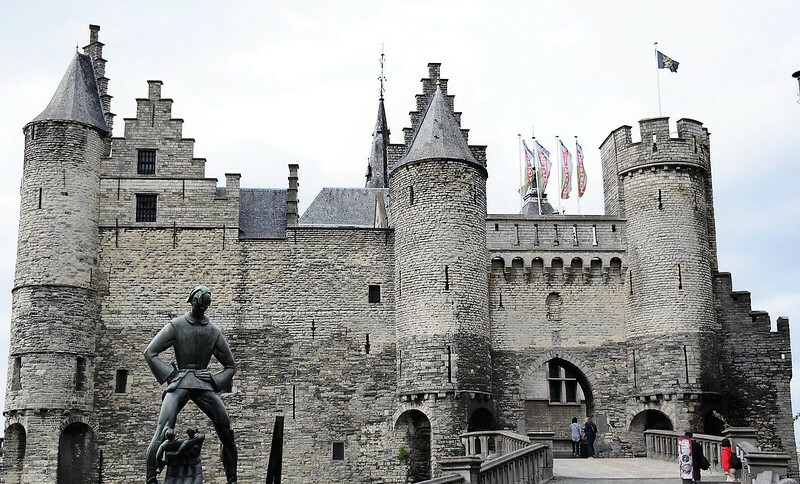 Over 700 years of Dutch History in one place, or better saying, in one castle. 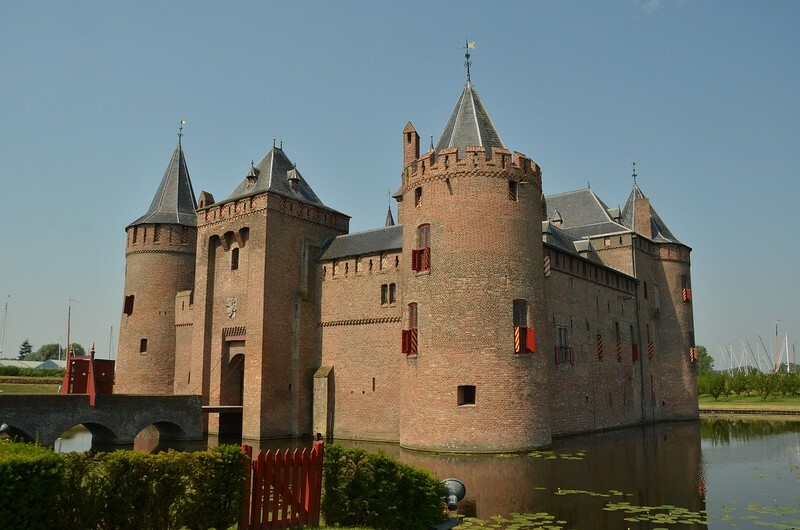 The Muiden Castle is by far the most gorgeous medieval castle in the Netherlands. Only 15km away from Amsterdam, this castle offered protection to the city on the Eastern front. Today, this UNESCO Heritage Site entertains tourists of all ages. The castle’s interior was restored and the new 17th-century decoration gives the Muiden Castle an imposing medieval look. Especially because of the interesting collection of weapons and armor. 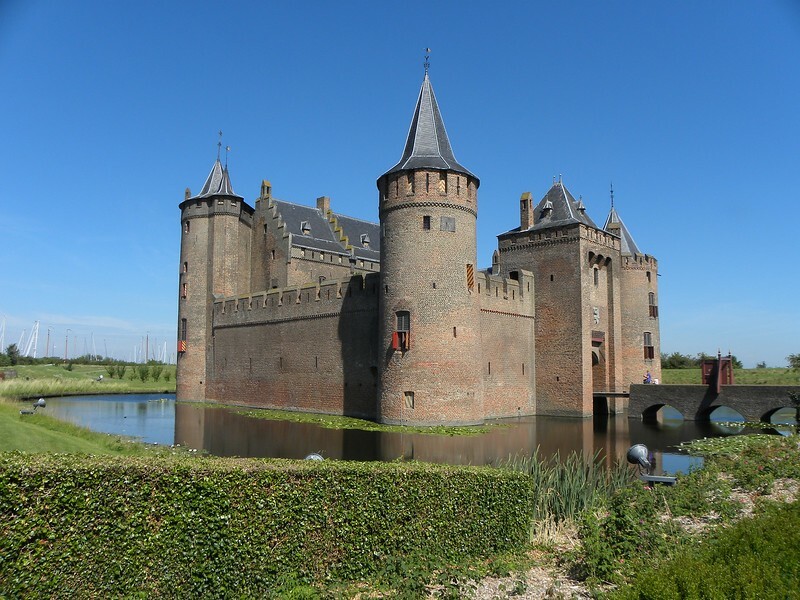 As a very traditional castle, Muiden Castle (Muiderslot in Dutch) is surrounded by water and you can reach it in the old-time style, by boat. PS: If you visit the Netherlands in the spring, I’m sure you will fall in love with their neatly cared gardens. Once known as the Impregnable Castle of Bohemia due to its thick walls, Loket Castle is one of the oldest and most valuable castles in the Czech Republic. 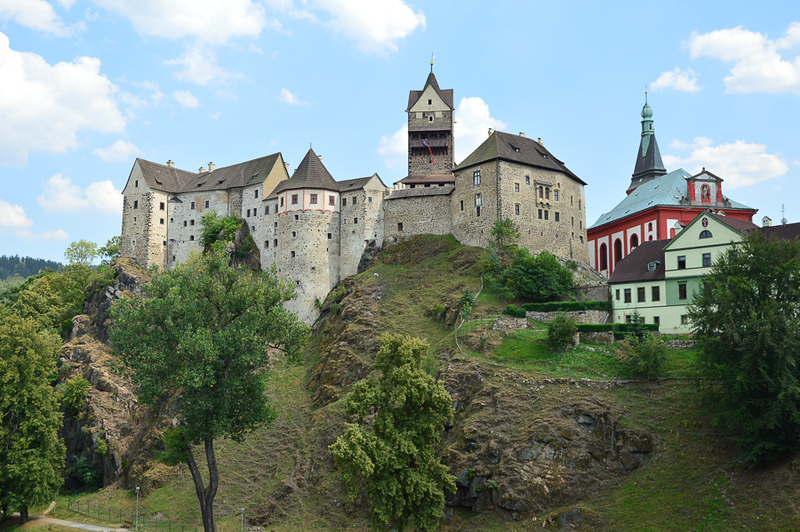 The castle and the town of Loket are like something out of a storybook and ridiculously photogenic! Indeed the town and the castle both appeared in the 2006 James Bond film Casino Royale. In contrast, Loket Castle includes possibly the goriest museum of torture that I have ever seen! I actually left the exhibit after only a few minutes as the moving exhibits were just a bit much but if you enjoy a bit of gore you will absolutely love it! 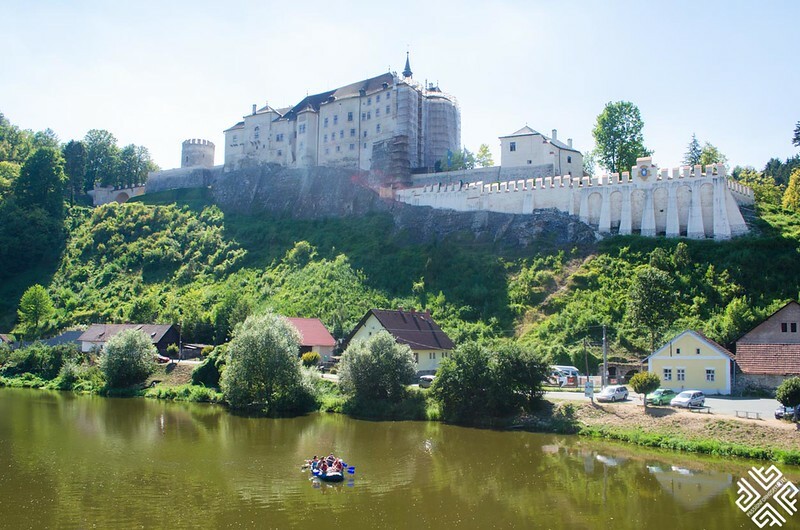 This lovely 12th-century castle is less than 10 minutes from the gorgeous spa town of Karlovy Vary and 2 hours from Prague. 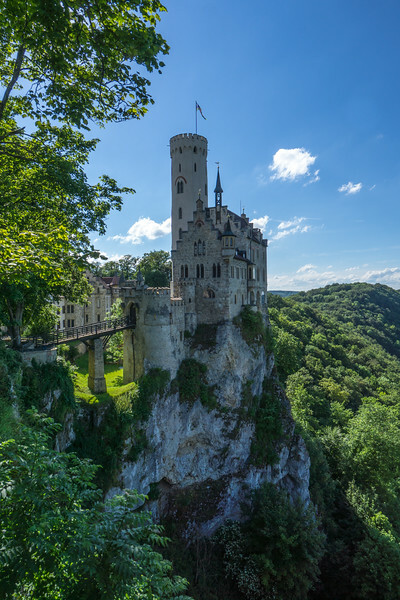 Lichtenstein Castle, not to be confused with the country, is a strong contender for the most magical castle in all the land. Located in the Swabian Jura of southern Germany, the gothic revival style and the way it’s built upon this escarpment make it look like it came straight out of a fairytale – and in some ways it is. The modern castle was inspired by the novel Lichtenstein and was built in the early 1840s. It’s still owned by the Duke of Urach but it’s open to the public daily. Nowadays it’s a tourist attraction with tours all throughout the day and several hiking trails nearby. The easiest way to get there is by car. There is nothing I love more than seeing the turrets of a castle in the distance especially ones that I had no idea about. As we were riding the “Hop On Hop Off” bus around Copenhagen, I briefly saw them in the distance. Rosenborg Castle is different from many we have seen. While it houses many everyday items that the Danish royal family used, it held more artwork than I have seen at many others. The pictures were so beautifully painted and there were so many different types, ranging from landscape to floral among many others. The portraits were incredible. It felt like the eyes were following you around everywhere you went. The rooms are a little darker than the usual bright rooms we have seen as well. It made you notice all of the tiny things within the rooms so much more and it also made the pieces that were housed in them so much more significant. Another amazing set of items that this castle holds are the Royal Crown Jewels in a vault underneath. The vault was manned by two soldiers that had the biggest guns I have ever seen in my life. As we walked around looking at all of the amazing and expensive jewelry, we were all thinking how amazing it would be to actually wear it! As I said to the girls it is possible…the next Queen of Denmark is an Aussie girl! Located at the bank of the Scheldt river, Het-Steen, or simply “Steen Castle”, is a 9th-century castle that happens to be the oldest monument in Antwerp, Belgium. Originally raised as a castle which is evident from its design, it was then expanded into a formidable fortress with stone wall and gatehouses that defended the city for centuries. Steen Castle later served as a prison, a residence, a sawmill, and a fish warehouse until it was reopened to the public as a museum in 1863. Now that’s what you call a multipurpose monument! The best thing about this fascinating castle is that it stands right across the city center, near the port. When you go to the T-Steen you can also enjoy watching the sunset, gazing at the ships sailing by and the windmills at the horizon. You’ll certainly notice the Semini statue, a symbol of fertility, which was maimed by Catholic priests in the 16th century. 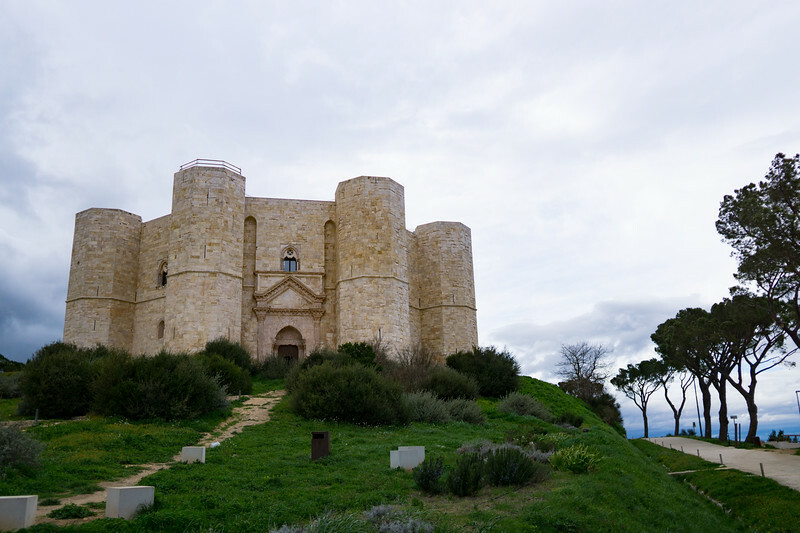 One of the nicest looking castles in Europe is San Michele Castle, located in Cagliari, Italy. Visiting is one of the nicest things to do in Sardinia, and the best part of it is that, since it is not on the main tourist trail, it is actually very quiet. The castle surmounts the mountain that takes its name, and this location is perfect to admire gorgeous, 360 degrees views of the city. The castle was likely founded in the late 12th century, though it reached its peak importance between 1350 and 1511, when the Carroz, an important Spanish family, made it its residence. The castle had defensive functions: it has 3 main towers and used to be surrounded by a moat. It was abandoned in the early 17th-century and subsequently used as a sanatorium during the plague of 1652-1656, and later on again as a defensive point against French invasion. Nowadays, the castle can be visited throughout the year. It often hosts an art exhibition. The bonus for animal lovers is the protected cat colony that lives in the beautiful park that surrounds it. Bled Castle is standing on a mighty steep cliff 1300 m high, surrounded by impressive natural beauty, mountain ranges in the background and a unique view of the picturesque lake and its island. 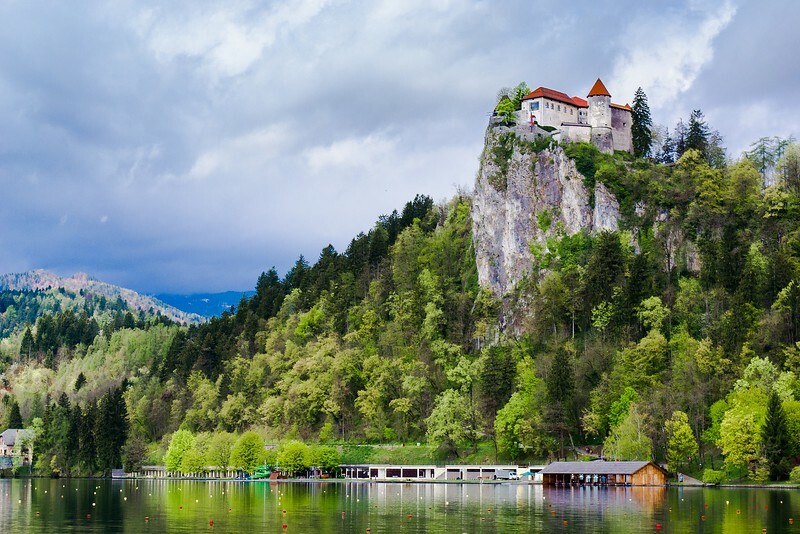 Bled Castle with the lake and its island together represent an icon of Slovenia and is the most visited historic and cultural attraction in the country. This medieval and oldest castle in Slovenia houses a museum collection (representing the historical development of Bled town), a castle printing works (traditional manual printing), the castle cellar, the castle smithy, a small chapel, nice restaurant with a view of the lake and two courtyards. The castle also hosts wedding ceremonies, numerous cultural events, from which the most important are medieval days. 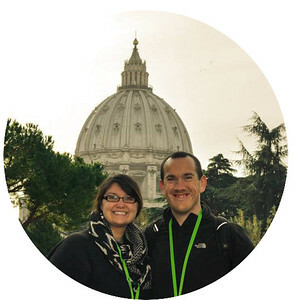 We are Sion and Ben from The Globetrotter Guys and while we love to travel the world, we never forget where we come from! Sion is originally from North Wales and was lucky enough to live just 5 minutes drive from the beautiful Conwy Castle (Castell Conwy in Welsh!) which has been classed as a world heritage site by UNESCO. Conwy Castle can be found on the North Wales coast and is situated in the town of the same name. The castle was constructed in 1283 and its walls encompass the whole town. 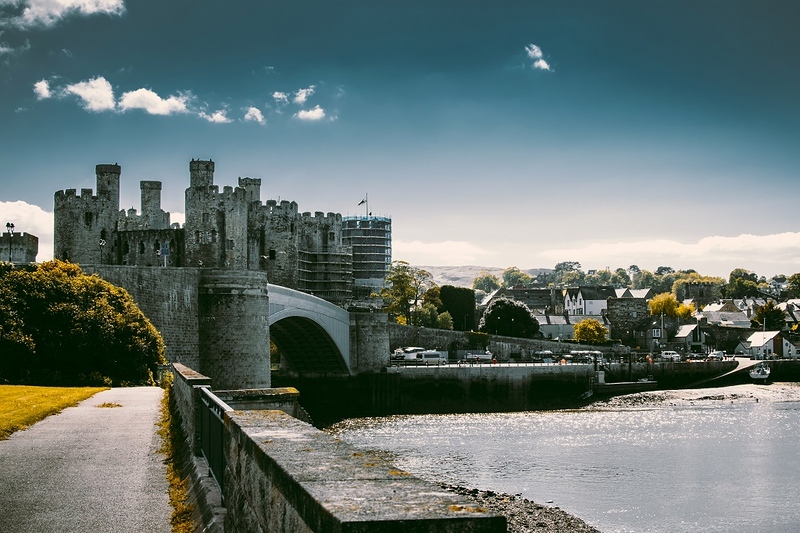 This is one of the main reasons we love Conwy Castle, you can walk the walls around the entire town and get the best views – it’s the best way to see Conwy! The castle sits on the edge of the Conwy River. The combination of the river, the castle and surrounding greenery makes this a spot not to be missed! 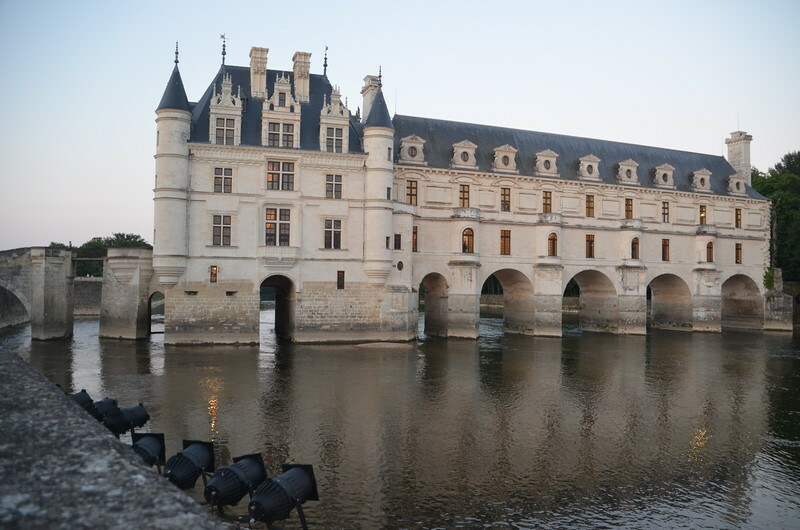 If you are considering a Loire Valley itinerary to explore some truly stunning castles in France, you should definitely include Chenonceau Castle to your visit! It is definitely a must-see in France, thanks to the originality of its architecture and its unique history. 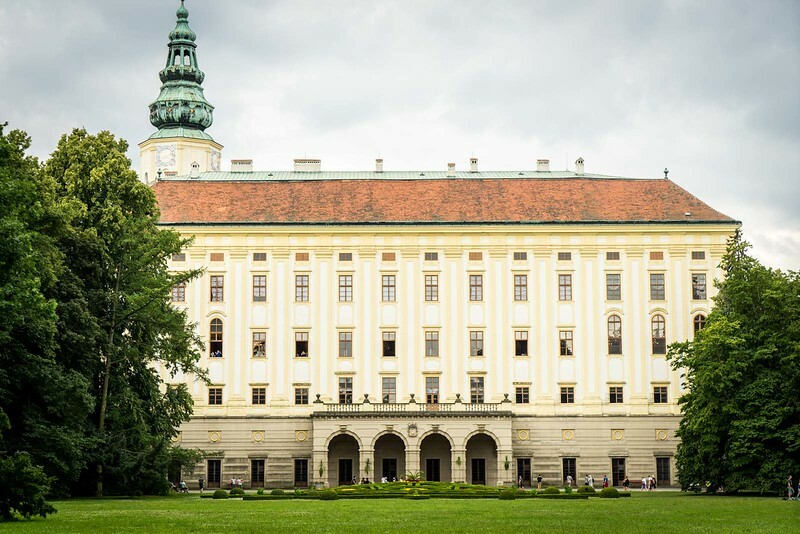 You will start the visit by walking through the main alley covered with plane trees, allowing the overall beauty of the castle to slowly unveil. You will soon reach the two gardens and will get captivated by the history of the castle and its inhabitants. 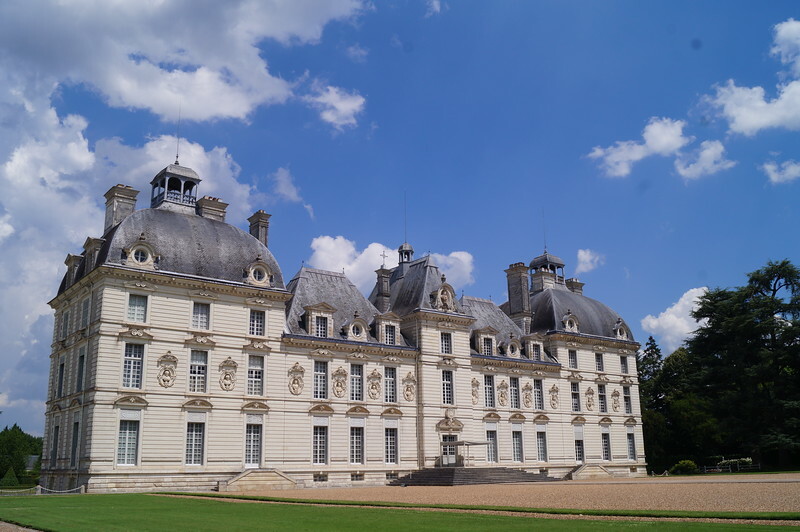 You will learn about the jealousy, the rivalry of two strong women of the French History, Catherine de Medici and Diane de Poitiers and will be surprised to learn that this castle is the only one in the Loire Valley that has been built and restored by women. Its architecture is fascinating: not only from the inside with the bedrooms, the study of Catherine de Medici, the living room but also from outside. The castle is built spanning the Cher River and the elegance of its arches and the subtle water motion underneath add to its splendor. Castel dell’Ovo is probably one of the most beautiful castles in Naples, Italy. It lays on a tiny island named Megaris, tied to the mainland by a charming stone bridge. This place is possibly the most romantic spot in Naples at night: many couples come here to swear eternal love! At its feet, there is a tiny fishermen’s village named Borgo Marinari. The castle name, translated to English, means “Egg Castle”. The reason behind it is an ancient legend about the poet Virgil. Everyone believed him to be a powerful sorcerer. He thus said that he’d put a magical egg into the Castel dell’Ovo foundations to protect the city. Should the egg ever break, the castle and the whole city would fall into ruin: people were terrified every time a war or an earthquake happened! Neapolitans, after all, are still very much superstitious! 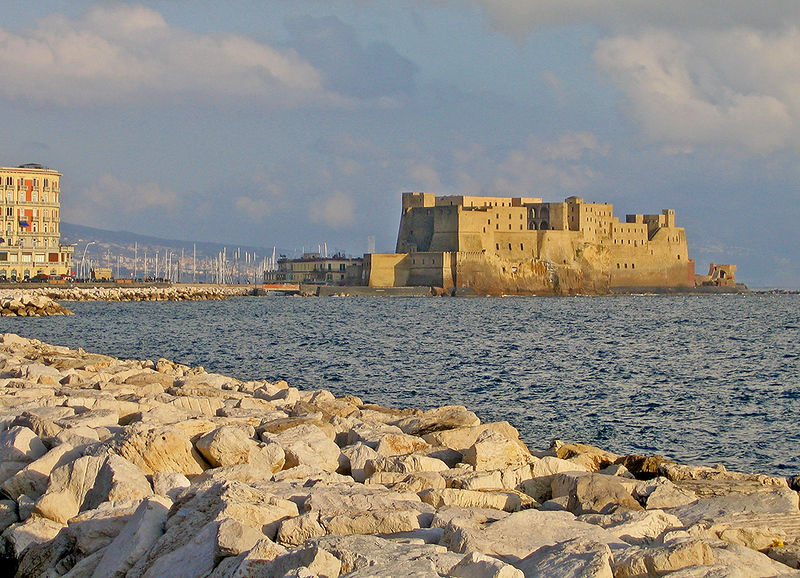 Castel dell’Ovo is yet another one of the many things you can visit in Naples for free. The view from the cannons terrace is absolutely spectacular! Of all the amazing castles littered throughout Ireland, I couldn’t have been happier to stumble upon this one. 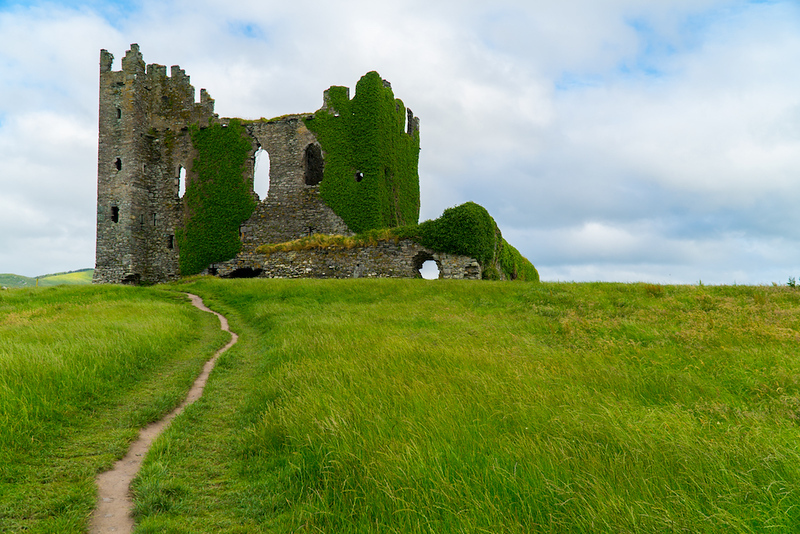 Balleycarbery Castle, covered in ivy and moss, was built in the 15th century and once owned by the McCarthy Clan. My husband and I were driving counterclockwise on the Ring of Kerry and decided to take a little detour following random signs. We weren’t too motivated given our over-crowded Blarney Castle experience, one of the most popular stops in the area. We decided to go for it anyway. Small, quaint, and almost completely isolated which definitely added to the whole experience. One of the many reasons why going off the beaten path has its rewards. 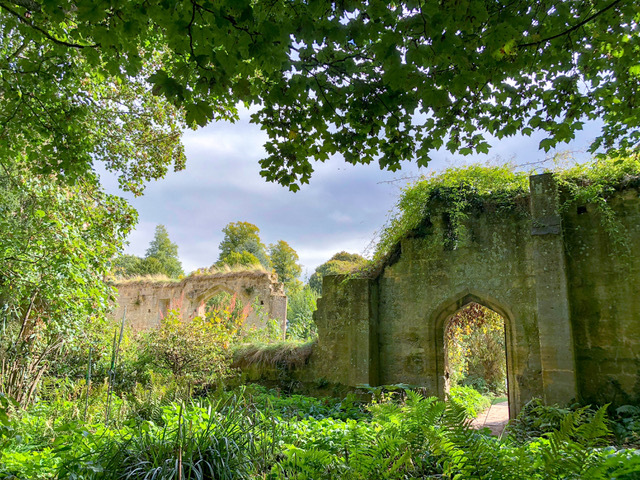 The castle is beautifully covered in green moss, you are free to walk through the corridors and stairways peeping out its arched windows imagining what it may have been back in its glory. Located on the right bank of the Tiber River, the Castel Sant’Angelo is one of the most intriguing buildings in all of Rome. It has a complex history and was initially built between 123 and 139 AD to be the mausoleum for Roman emperor Hadrian and his family. 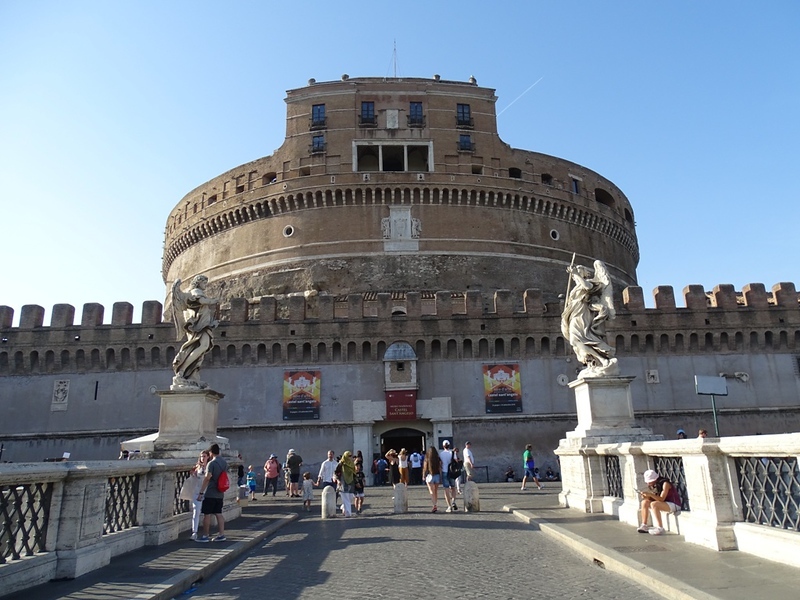 Converted into a papal fortress in the 6th century, it was named after Pope Gregory the Great had a vision of the Archangel Michael miraculously ending the plague that was running rampant through Rome. In the 13th century, a secret passageway, the Passetto di Borgo, to the Vatican was added so that popes in danger could escape to the thick, fortified walls of the castle. Most notably, during the 1527 sack of Rome, Pope Clemente VI took refuge here. Despite Castel Sant’Angelo’s turbulent history, today it serves as a museum where visitors can see beautifully appointed papal apartments, prison cells and torture chambers, Renaissance art, and some of the best views in Rome. Once upon a time, castles were the heart of the village. In one seaside Dublin suburb, that’s still the case. For more than 800 years, Malahide Castle was home to the Talbot family. That long, sometimes brutal, history is illustrated in guided tours that show the castle as it was during the last Baron Talbot’s lifetime, right down to his military uniform, laid out as if he would be getting dressed at any moment. In 1975, his wife sold the demesne to the Irish State. Since then, the vast grounds have been the community’s playground, with football fields, walking paths, a cricket pitch, and even a golf course. 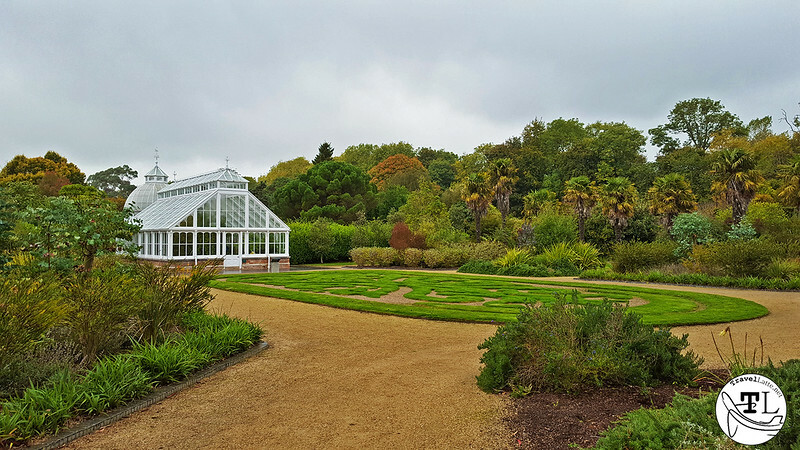 Along with the castle, the Lord Baron’s beloved gardens, greenhouses, and conservatory – the Malahide Botanical Gardens – are not to be missed. Being just 20 minutes from central Dublin, Malahide is as vital today as it’s ever been. Castles are generally foreboding hunks of stone with a gruesome history attached to them. And while I’m all about the history, sometimes a break from routine can work wonders on the way you look at something. Exhibit A: Warwick Castle. 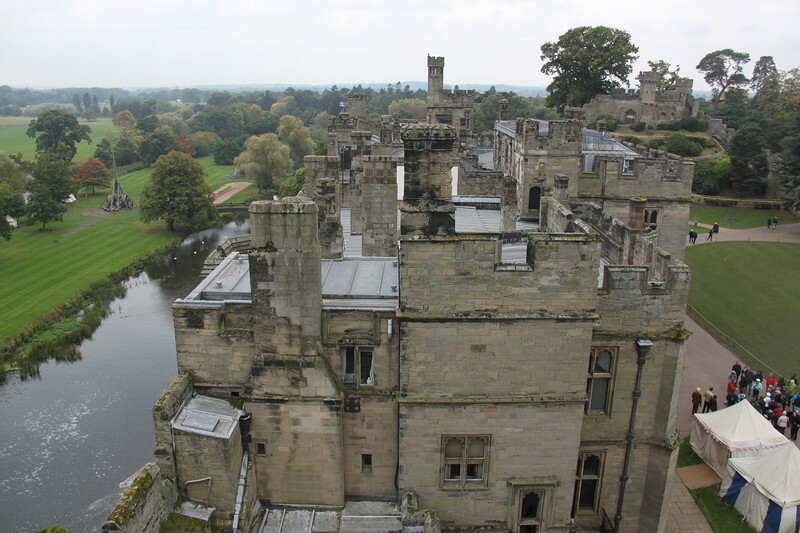 Situated at a bend along the Avon river, Warwick Castle has been fought over ever since construction began in 1068. After changing hands for seven centuries, it was converted into a country house. The Tussauds group bought the castle exactly four decades ago and have since converted parts of the castle into play areas where children go happily while the adults inspect the castle’s history over the centuries. It might be a kitschy castle for some but there’s a way of enjoying Warwick if you can look past the obvious tropes created by its parent company. There are lifelike statues of prominent members of the castle (because Madam Tussauds!) as well as a collection of arms and swords impressively arranged in the former great dining hall. Finally, I encourage you to climb the ramparts to inspect the castle grounds, Avon and breathe in centuries of history from the top of the castle. I have seen many beautiful castles in the past in the UK and in France. However, recently I fell in love with a variety of German castles, not only because of their rich history but also the incredible architectural beauty. My husband and I were driving along the Swabian Alp between Stuttgart and the Bodensee when we noticed a giant castle in the distance. It was built on top of a hill and looked like it came straight out of a fairytale. We decided to make a detour to take a closer look. Hohenzollern Castle is built on the ruins of a former castle dating back to 1267. You can book a guided tour that takes you through the myriad of beautiful rooms and for those of you traveling with kids, this is the castle you should visit. 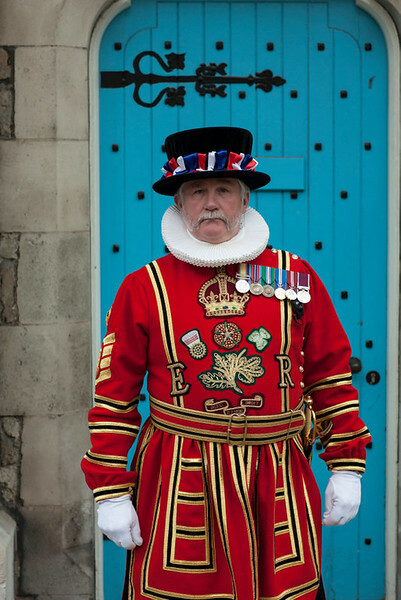 They can dress up like kings and queens and are entertained by actors throughout the tour. 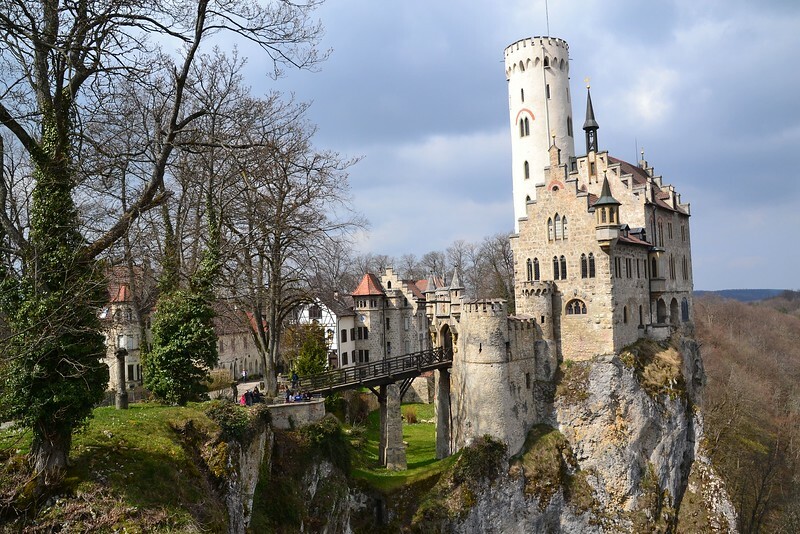 While many drool over the Bavarian castles near Munich, if you really want to experience the beautiful medieval castles in Germany then head either to Rhine or Moselle river valley region. 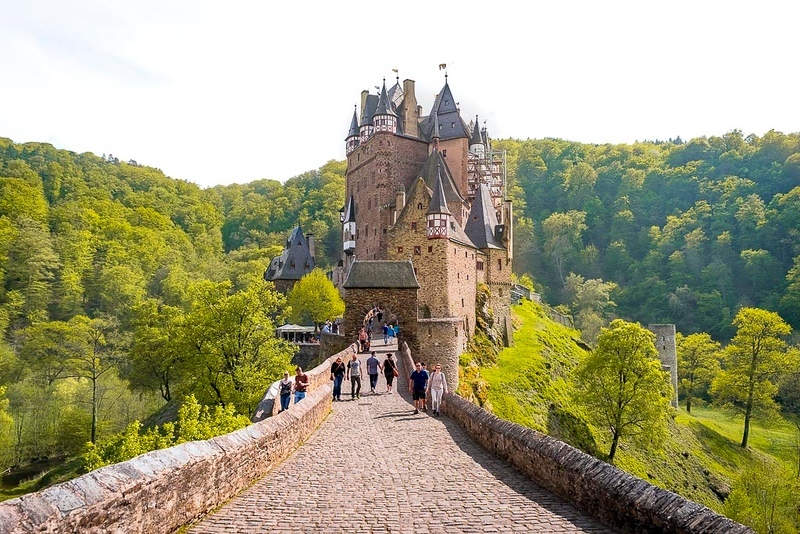 Our favorite castle in that region is Burg Eltz which looks just as majestic in person as it does it photos. Eltz Castle is still owned by the same family that lived there since the 12th century. It’s absolutely free to roam around the castle and you only pay an entrance fee if you want to go inside to see the family rooms. The castle is about 2 hours away from Frankfurt and 1.5 hours away from Cologne. There is a short hike to get to the castle through the forest nearby which starts from the parking lot. You also have the option to take a shuttle bus to the castle if you don’t want to hike. A visit to Gozo is a must do when visiting Malta and the Cittadella in Victoria is one of the most popular attractions. Perched high above the city, it has been at the center of activity on the island since Neolithic times and was fortified during the Bronze Age around 1500 BC. It was later developed by the Phoenicians and in Roman times it became a complex Acropolis. 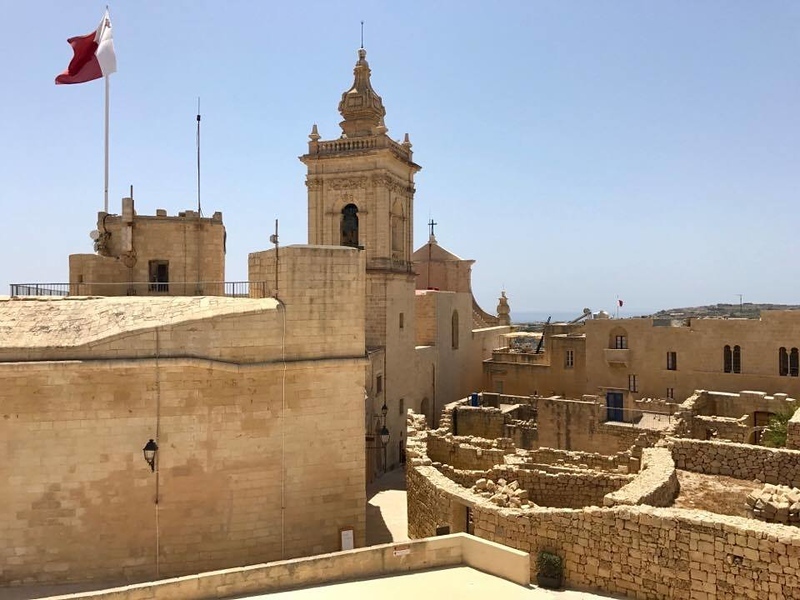 As Malta has been invaded and occupied by many countries through the centuries the Cittadella has served as a fortress and a garrison and has been the source of refuge for many. Today, the Cittadella – also known as the Castello, contains a number of churches and historic buildings, including the magnificent Cathedral of the Assumption, which was built between 1697 and 1711. The Cittadella has been included on Malta’s preliminary list of UNESCO World Heritage Sites since 1998. Having undergone a massive 5-year restoration process we were very impressed to discover what is effectively a small ancient town in perfect condition and were stunned by the beauty and workmanship that has been involved in creating her. 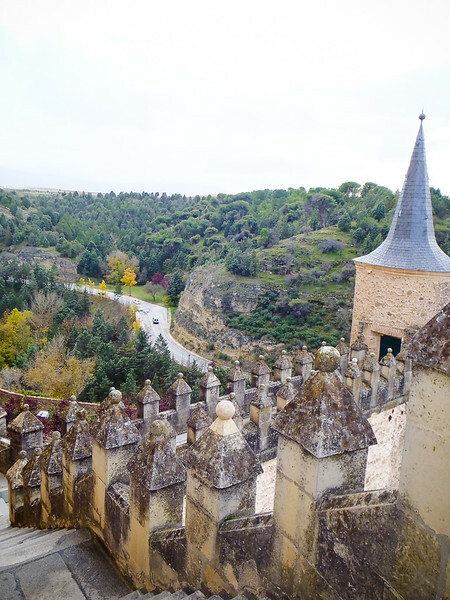 Located in Spain’s central Castile and León region, roughly an hour’s drive northwest of Madrid, the historical city of Segovia is blessed with a handful of architectural marvels. The phrase “fairytale-like” gets thrown around a lot—but in this case, it’s a fitting epitaph for the 12th-century Alcazar of Segovia. It’s so picture-perfect, the Alcazar is said to have inspired the design of not one but two iconic castles in pop culture: The Queen’s castle in Snow White, and Cinderella’s castle. Variously used as a royal palace, a prison, and an academy, the Alcazar takes its name from the Moorish word for castle or fortress. The halls and chambers are just as exquisite as the exterior—I love the stained glass and incredibly intricate ceilings. Take your time when visiting the pretty interior courtyards strung with ivy, and make sure you climb the Tower of Juan for wonderful views of Segovia and its Roman aqueduct. Perched above the picturesque Bavarian countryside not far from the town of Fussen, Neuschwanstein Castle is, without doubt, one of the best castles in Europe. 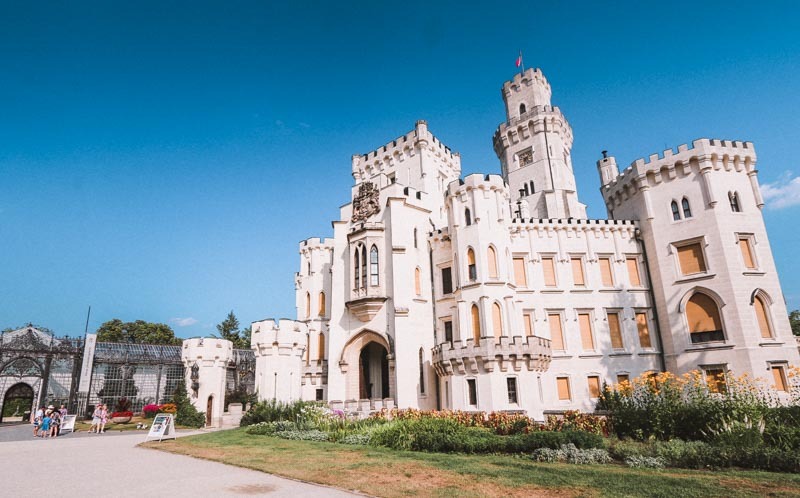 Built for King Ludwig II of Bavaria in the 19th century, the castle is believed to have inspired Walt Disney’s Sleeping Beauty Castle and today it attracts thousands of visitors every year. The interior of the castle, with its towers and turrets, can only be visited on a guided tour but its well worth parting with the ticket price to see the exquisite furnishings inside. The wealth of the 19th-century royals beggars belief – and to think Neuschwanstein was just one of three castles Ludwig had built! After checking out the inside of the castle, take the path to Marienbrucke. The scenery along this 15 to 20-minute walk is stunning and when you reach the Marienbrucke, you’ll have the best views of Neuschwanstein Castle. 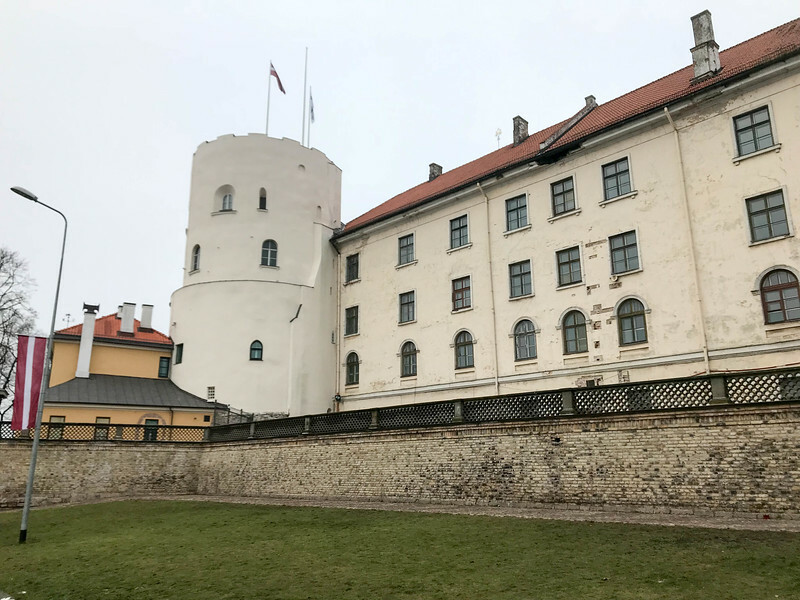 Riga Castle was built in 1330 and located on the bank of River Daugava, due to many wars, the castle needed to be renovated and reconstructed which also resulted in its appearance and size changes throughout the history. Today, Riga Castle is the house of the Latvia president, there are also many museums that tourist can visit any time of the year. What I love about this castle is how simple it looks but it carries history and survived many wars. It is also located in the Old Town of Riga which means that it is very easy to visit. If you are looking for the best things to do in Riga, exploring this historic castle is definitely one of the best attractions. As soon as we saw a viral photo of Scaliger Castle on Lake Garda in Italy, we knew we had to see it for ourselves and we did. It is just as magnificent as the photos reveal, if not more. The castle is known as the “Sinking Castle”, however, that is not the case. It is actually just a rare example of medieval port fortification. The reason why we love Scaliger Castle so much is that, in addition to its unique look of sinking into the lake, it has a true fairytale feeling to it. It has a drawbridge, a moat, beautiful architectural towers and stunning views from the top. 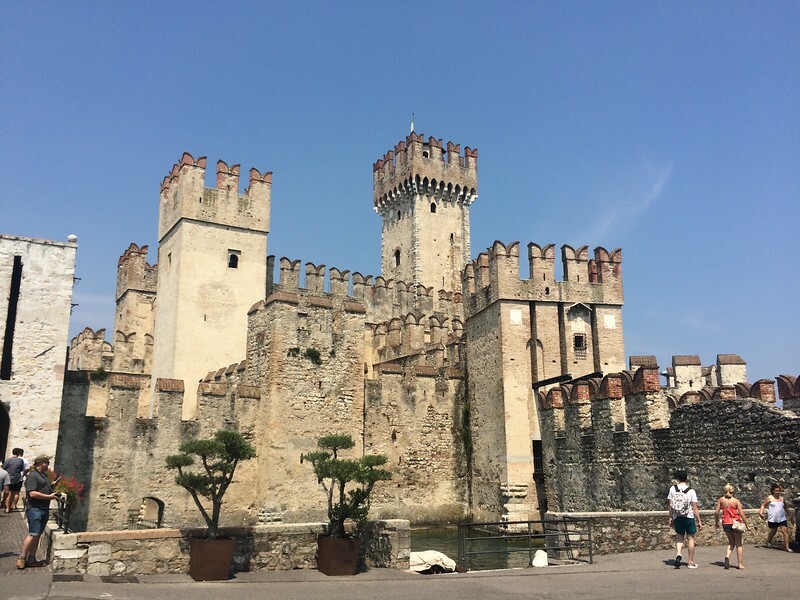 Scaliger Castle is an amazing sight to see and explore while you are in Northern Italy. 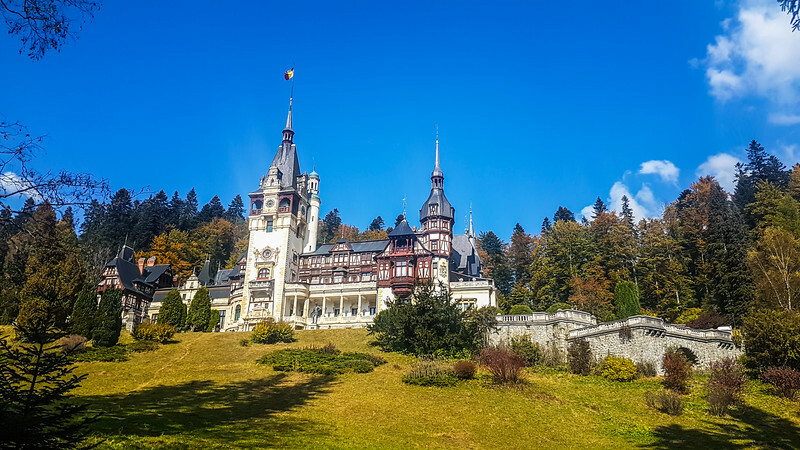 Peleș Castle in Romania is definitely a must-see. Its charm will instantly seduce you, especially given its location. Situated in Sinaia, a less than 2 hours drive from the capital, Bucharest, it lies in the middle of the Carpathian Mountains. So, you not only get to view a magnificent castle, but you will also be impressed by the surrounding mountains. The Peleș Castle is Romania’s most famous, and many will also say the most beautiful, castle. It was home to the Crown of Romania, its construction started in 1873 and ended in 1914. Unfortunately, when the Communist regime made its way in Romania, the King was forced to abdicate and the castle transformed into a museum. Today, Peleș Castle receives numerous visitors coming from all corners of the world to enjoy this splendid historic building. The Tower of London is one of the UK’s most historic castles. It’s a must-see for anyone planning a visit to London. It’s not every day you get to see the Crown Jewels, the execution site where three of England’s Queens were beheaded and suits of armor made for kings like Henry VIII and Charles I. Go at the beginning or end of the day to avoid queues to see the Crown Jewels – it’s worth it to see some of the most famous jewels and diamonds in the world. 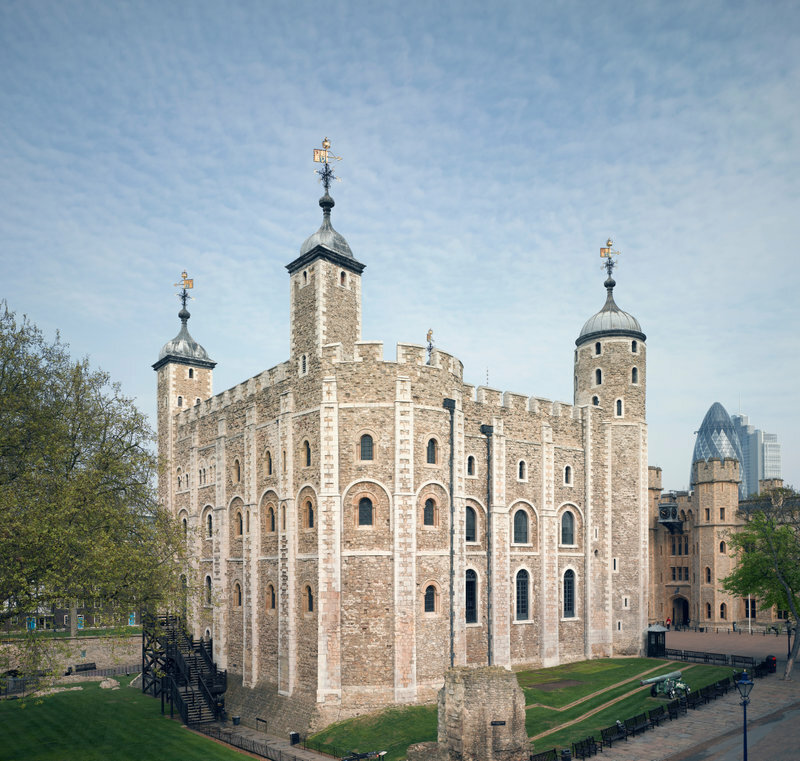 Try to spot the iconic ravens and be sure to go on a Beefeater tour where you’ll hear some of the more gruesome stories about the Tower’s history. There are plenty of beautiful castles around Europe, but neither can rival Pena Palace’s eccentricity. I mean, unless it’s an inflatable McDonalds castle, bright red and yellow are not the colors you associated castles with, right? Being a beautiful representation of the 19th-century trend for exoticized romantic architecture, Palacio Nacional da Pena is one of the biggest attractions in Portugal. Located on a top of a hill and surrounded by dense forest, it is arguably the most picturesque palace in the world. If you want to visit Sintra and check out the Pena Palace, you better get there early. 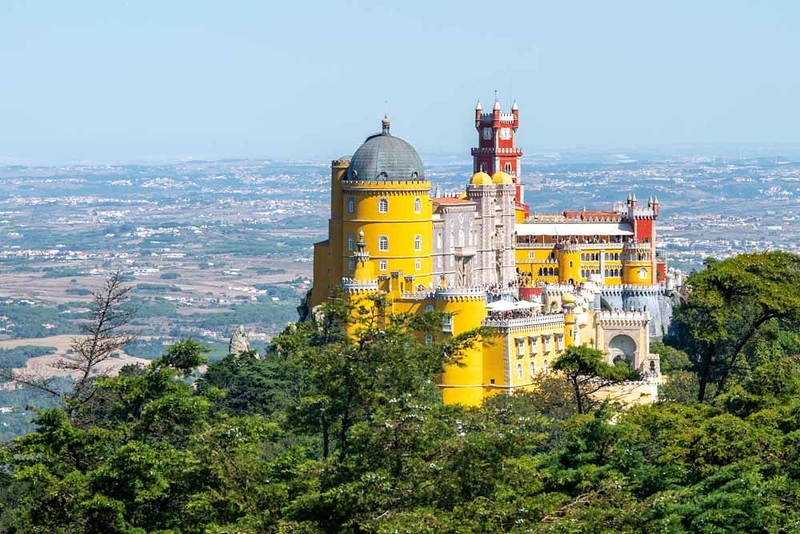 Only a 40-minute train ride from Lisbon away, the place is one of the most popular day trip destinations and getting there later would mean you have to spend your day waiting on lines than enjoying the vivid colors of this quirky castle. 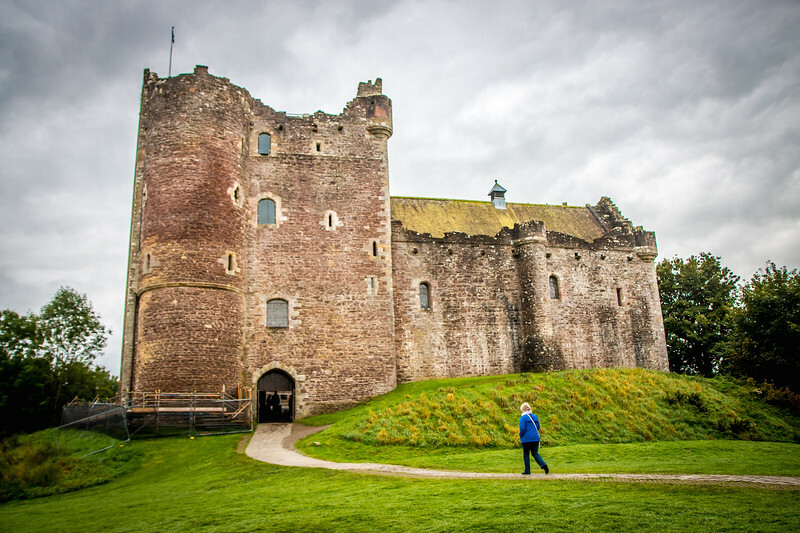 Located near Loch Lomond in central Scotland’s Stirling district, Doune Castle should look very familiar to anyone with an interest in popular culture. Built in the early 1400s for Robert Stewart, the Duke of Albany (and grandson of Robert the Bruce), the medieval castle has been inhabited by Scottish legends ranging from Mary, Queen of Scots to Bonnie Prince Charlie. In more recent times, it has appeared in everything from Monty Python & the Holy Grail and Game of Thrones to Outlander. The reason for its popularity should be obvious from your visit: The castle is vast and largely empty, leaving plenty of room for imagining its ancient history. The excellent audio tours (narrated by Monty Python’s Terry Jones and Outlander star Sam Heughan, depending on which track you choose) add great historical context to rooms such as the Great Hall, Lord’s Hall, and kitchen. It was arguably our favorite castle in Scotland but get there early if you visit in peak season and want to avoid the crowds. 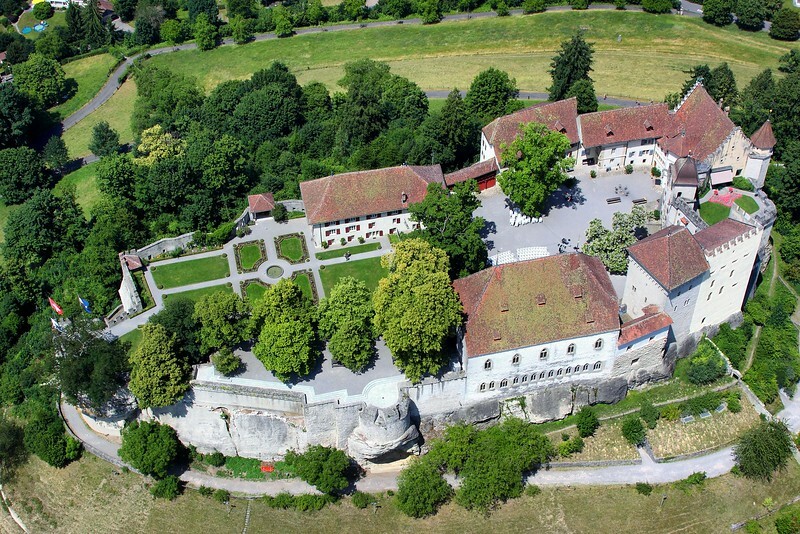 The castle of Lenzburg, located in the “Kanton” (like a state) of Aargau in Switzerland, is special due to its location on top of a hill, which rises up over 100 meters. The oldest parts of the castle date back to the 11th century and is a heritage site of national significance. Since the castle went into the hands of the state in the 60’s, it was renovated and re-opened as a museum later, which it still is today. The castle of Lenzburg is also a perfect day trip from almost every major city in Switzerland, but especially when visiting Berne, Lucerne or Zurich. Together with the nearby castle of Hallwyl, it’s certainly a good choice for everybody that loves castles. While it’s Prague that gets most of the attention in the Czech Republic, the whole country is full of beautiful historic castles. One of the most important – and a World Heritage Site – is Kroměříž Castle. The first residence was built in 1497 and then rebuilt at the end of the 1600s after the Swedish army had ransacked it. 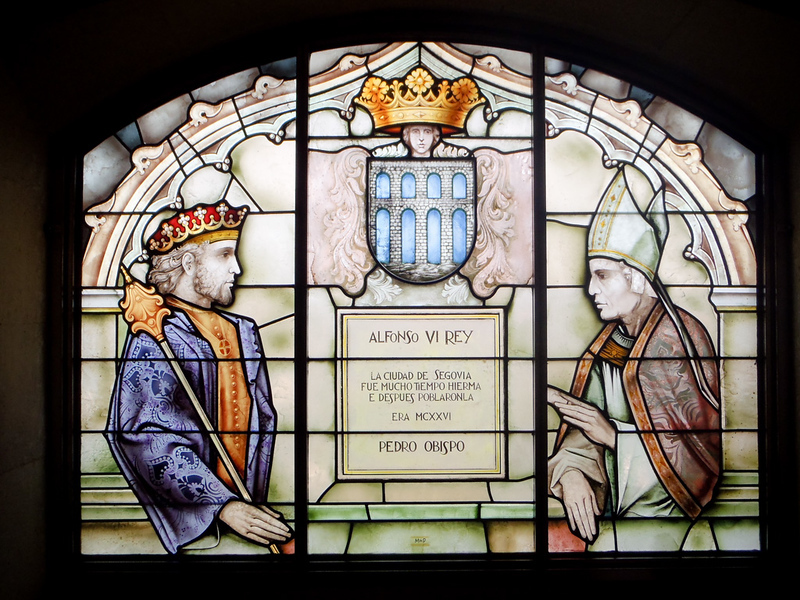 At this time, it was home to the politically-powerful bishops of Olomouc. Today you can only visit the interior of Kroměříž Castle on a guided tour. What is so incredible is not just the building, but the treasures inside. And it goes well beyond the ornate furniture and grand decorations. The library has tens of thousands of books, with manuscripts from composers like Mozart and Beethoven. And the artworks that are kept here are considered the second-best collection in the country. The gardens that are attached to the castle are also beautiful and one of the other main reasons it was added to the World Heritage List. 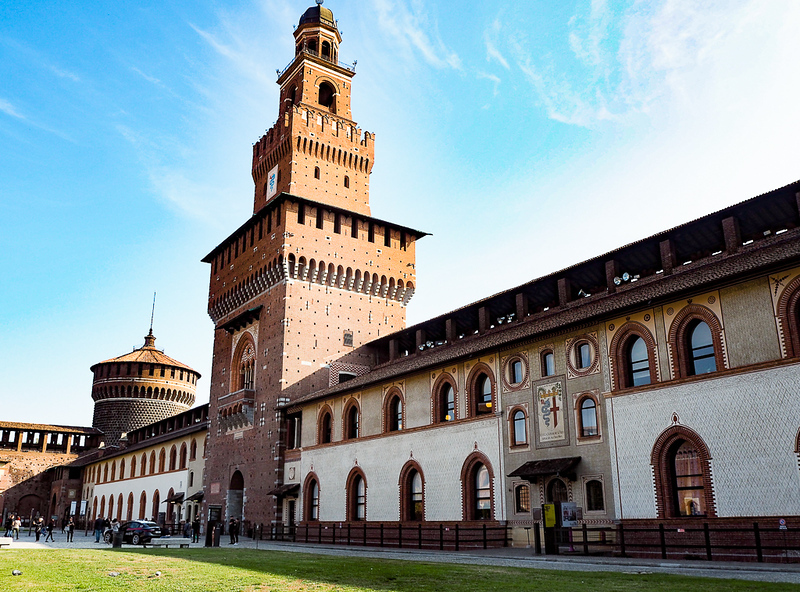 In the heart of Milan, Sforzesco Castle is an imposing fortress built by the powerful Sforza family in the 15th century. Surrounded by a moat, the turreted castle is a huge complex that houses several museums dedicated to the fascinating, yet often overlooked, history of the city. While rival Florence is often credited with being the cradle of the Renaissance, it is fair to say the great artists were nurtured in Milan. 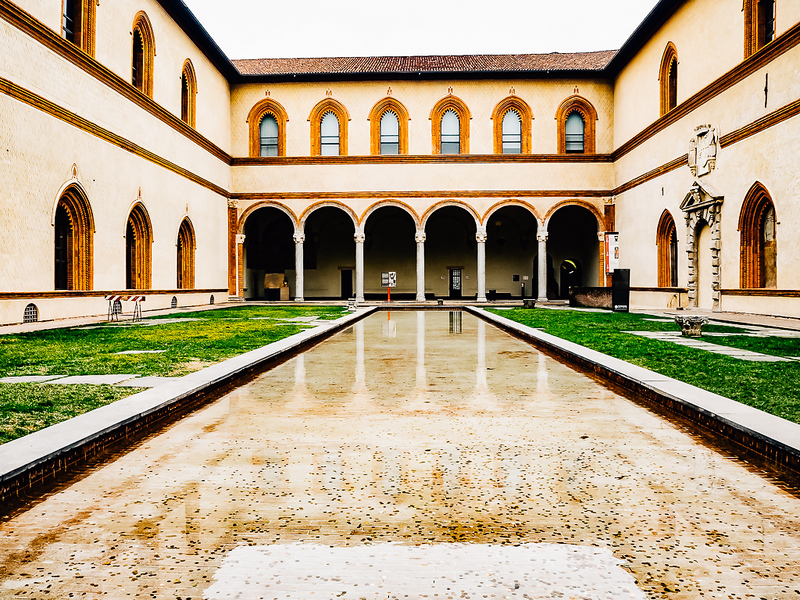 At Sforzesco Castle, Leonardo da Vinci was commissioned to decorate several rooms as well as famous Last Supper painting found at nearby Santa Maria delle Grazie. You can see his entrancing frescoes in the Sala delle Asse and then bask in the beauty of Michelangelo’s last sculpture known as the Rondanini Pietà. Sforzesco Castle is in central Milan surrounded by beautiful Parco Sempione. It is a must-see stop for history and art lovers visiting northern Italy. 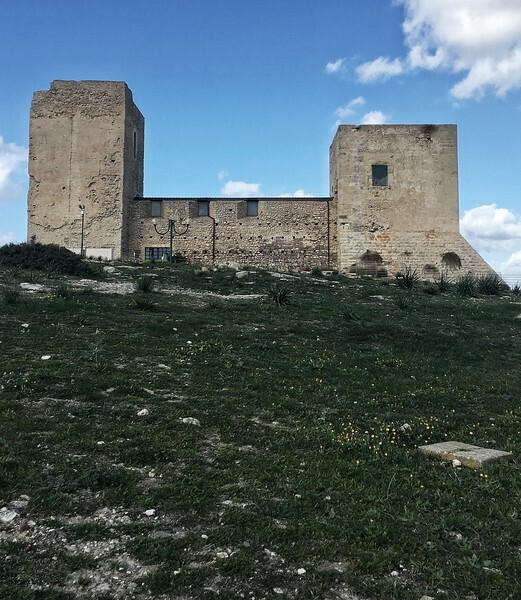 The medieval Castel del Monte is located on a hill overlooking the northern Puglian landscape of olive groves and rugged stone terraces. It’s a curious structure – some have even implied it’s not a castle at all due to its lack of a moat or drawbridge – that inspires the imagination, but that does look somewhat out of place in its surroundings. Despite its unknown original purpose, the castle draws in visitors with its unique charm. Built in an octagonal shape, the original design drew on many different cultures for inspiration – many of which are evident as you explore the site. Today, you can walk around the site for free, marvel at the vast views and relax on the lawn for a picnic. But to venture inside you’ll have to pay a small fee for the privilege. Cardiff Castle is special because it’s a mixture of Roman fort, bona fide medieval castle and extravagant Gothic fantasy all rolled into one. It dominates Cardiff city center and is one of the first places many visitors to Wales see. The 12th century keep tower gives a great view over the city, and the 19th-century outer walls hide tunnels which doubled as bomb shelters during World War II. 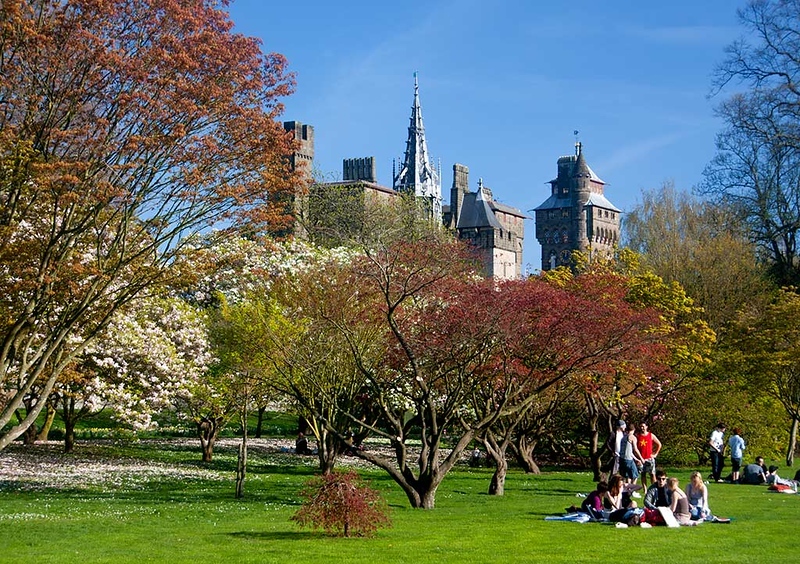 However, the most memorable part of Cardiff Castle is the 19th-century west wing, an ornate riot of decorated rooms and apartments built by the Third Marquess of Bute. He made his fortune from the nearby South Wales coalfields, and indulged his fantasies here and at fairytale Castell Coch, on the outskirts of the city. Bute Park, next door to the Castle, is a beautiful place for a walk with great views of the Castle exterior. Perched on a hill overlooking the River Sazava, the Český Šternberk castle is one of the most impressive in the Czech Republic. Built in the mid-13th-century by Zdeslav of Divišov — the castle received the name of his personal coat of arms which is characterized by an eight pointed star. In fact, the name is made up two words — Stern meaning star and Berg the mountain, perfecting describing this magnificent castle. The Český Šternberk castle has been under a private ownership for the past 800 years. First built in Gothic style, in the 16th-century, Baroque elements were added to its design. Its 15 rooms are decorated with gorgeous furnishings, opulent chandeliers and house an exquisite art collection. From the pretty rose garden visitors will enjoy splendid views of the river. 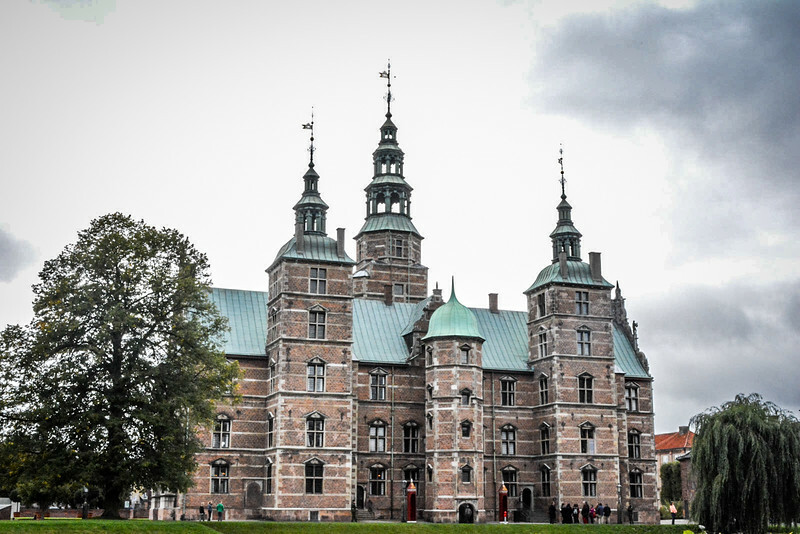 Located in the Danish town of Elsinore (English name derived from the Danish Helsingør) on the narrowest point of Øresund (entrance of Baltic Sea) between Sweden and Denmark, Kronborg is one of the most famous renaissance castles in Northern Europe. 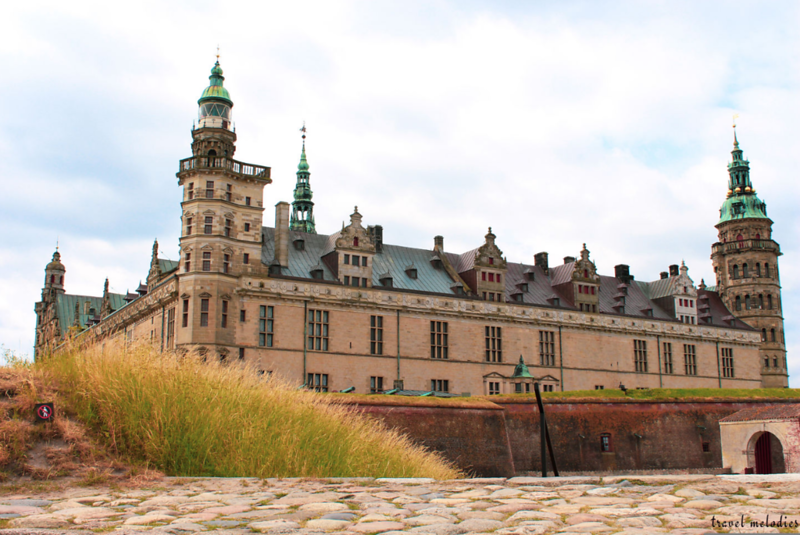 Kronborg is best known as the Hamlet’s Castle. Yes, this is the place where Shakespeare set Hamlet in. It hosts a famous Summer Shakespeare Festival. You can experience the rendition of Hamlet from June to August. It’s a delight to witness the in-place performances in different parts of the castle. The castle offers free tours in English and Danish for visitors. The castle was burned to ashes destroying most of the precious adornments. It was rebuilt and remained intact to the present day. 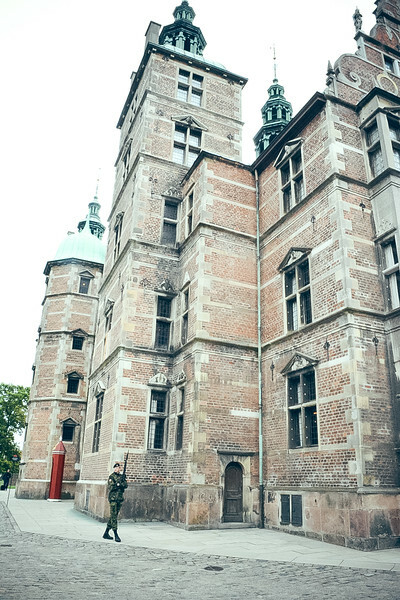 Kronborg became a UNESCO World Heritage Site in 2000. Helsingør can be reached from Copenhagen in just 40-45 minutes by train or rented car. It’s among the best day trips from Copenhagen. We visited the castle with kids. It turned out to be an amazing experience. The admission is free for kids (0-17) while it costs 140 DKK for adults. 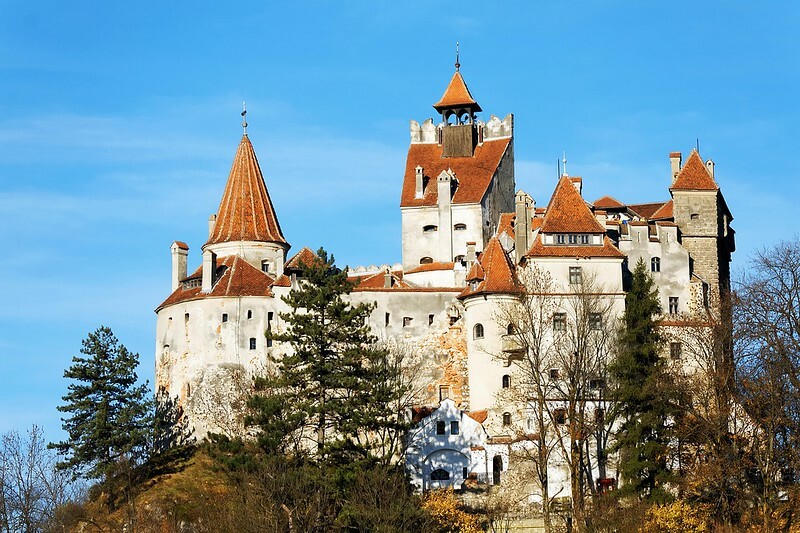 Bran Castle in Romania is a beautiful 14th-century castle with a nefarious past. The real-life Count Dracula, aka Vlad the Impaler, once lived here in this beautiful part of Transylvania, which formed the inspiration for Bram Stoker’s classic novel Dracula. Despite its roots as one of the scariest places in literature, Bran Castle is actually surprisingly beautiful, located high on a hill amongst the forest in the outskirts of Brașov, one of the most beautiful cities in Romania. I love it because I wrote a paper about Dracula during college and it was magical (and a tiny bit spooky) to get to visit this castle in person and imagining the book’s happenings taking place in real life. It is unique for its place in literary history as well as real-world history, as equally famous in legend as in historical importance. Arundel Castle is my favorite castle in the UK, and it lies on the south coast of England in the county of Sussex. Its history goes back a thousand years and this is reflected in its architecture. The ancient keep and battlements are the oldest area of the castle and lie partly in ruins; but the rest of the castle is a magnificent stately home, complete with an enormous hall full of treasures. Some of the rooms are set out as miniature museums showing what life was like in medieval times and also during the civil war. 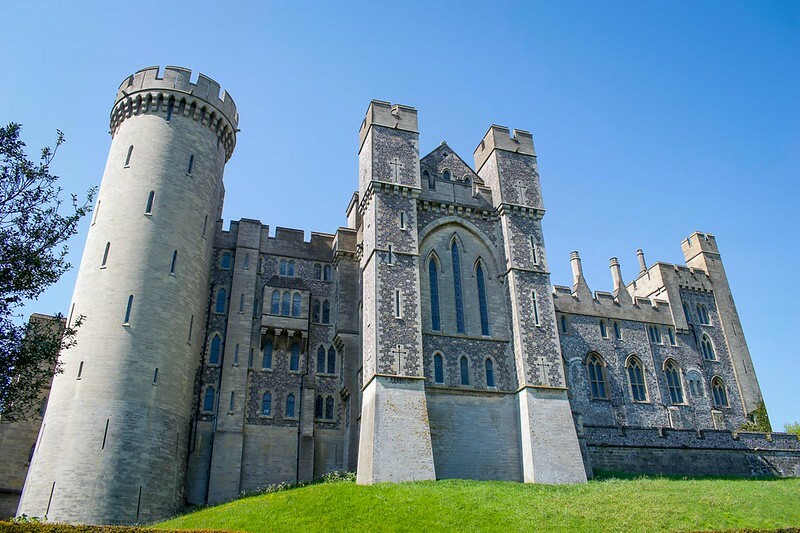 Arundel Castle has belonged to the same family for hundreds of years, and they still live there today. The gardens are equally as impressive especially in the springtime during the annual tulip festival, when thousands of bulbs bloom at once. The gardens are filled with water features including a crown that appears to float on a fountain. In short, Arundel Castle is unmissable inside and out and is worth making the effort to get to! 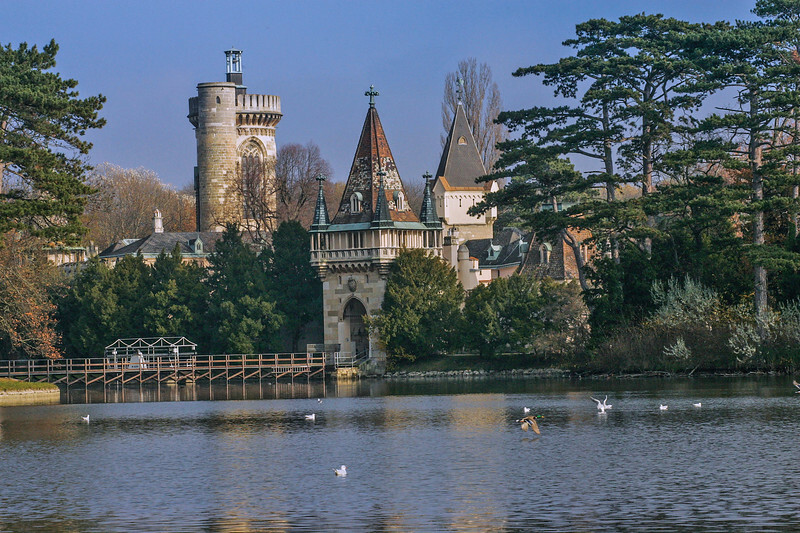 Laxenburg, a town just outside Vienna, is a small getaway destination for those who want fresher air, fewer people, less busy area, and just being close to nature for some hours. 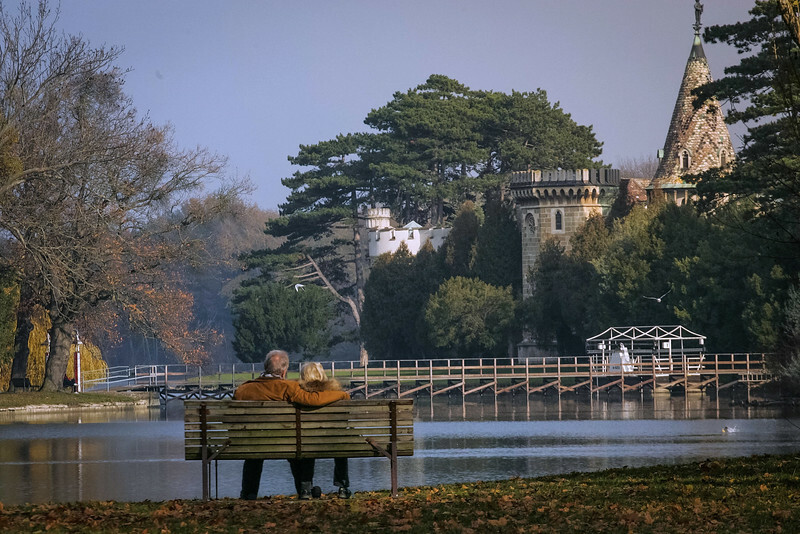 The town is most famous for the Laxenburg Park/Castle grounds which has castles and museums to explore, there’s also an English park, ponds that ducks and birds enjoy, and an island. 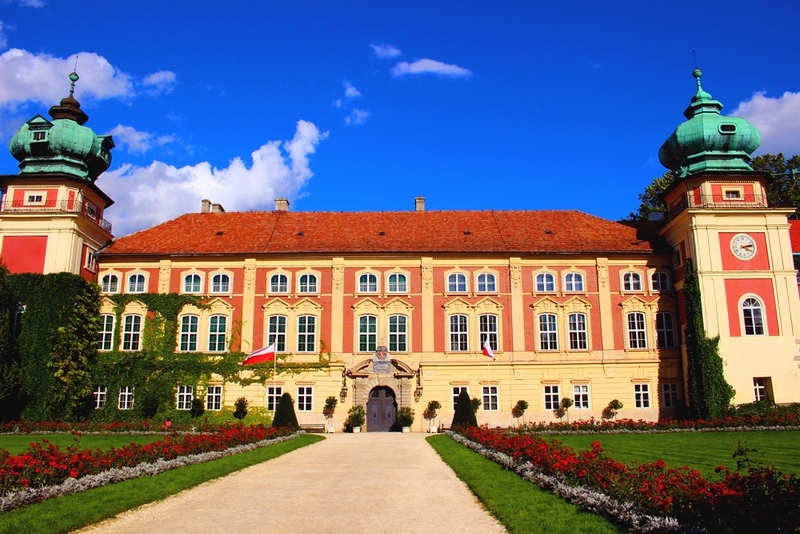 One of the more known castles in Laxenburg is the Franzensburg, it’s a moated castle on the island, which can be reached by going around the property or by riding a cabled boat across. When you visit, it is most likely that you’ll see boats of all kinds by the bank – these boats are for rent in case you want to spend some hours in the water. 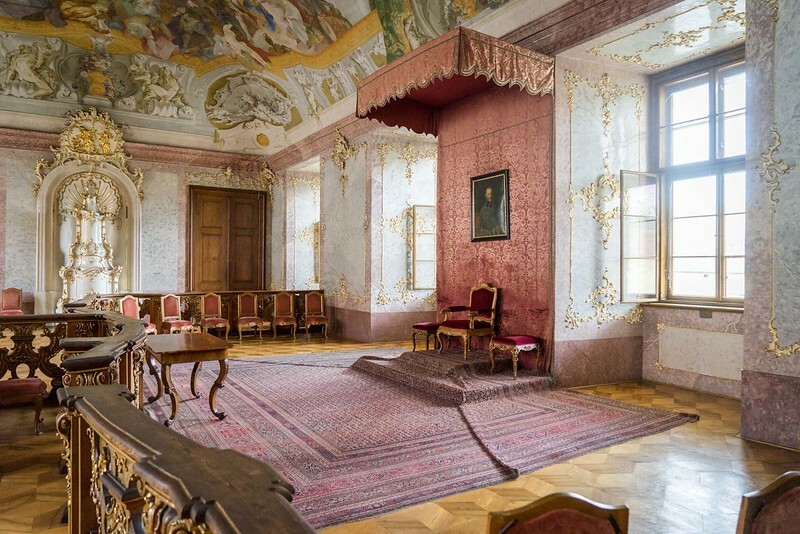 The Franzensburg houses a museum, which holds paintings of known painters (life-size ones), sculptures (made of marble), furniture, wood ceiling installations, as well as weapons from the 12th to the 19th century. The museum is called “little” treasure house of Austria, which ironically, is far from being little. Think Edinburgh, think Edinburgh Castle. This dramatic fortress perched high on a volcanic rock is for some the cherry on a very delicious cake. Every year a staggering 2 million visitors pass through its fortified gates. 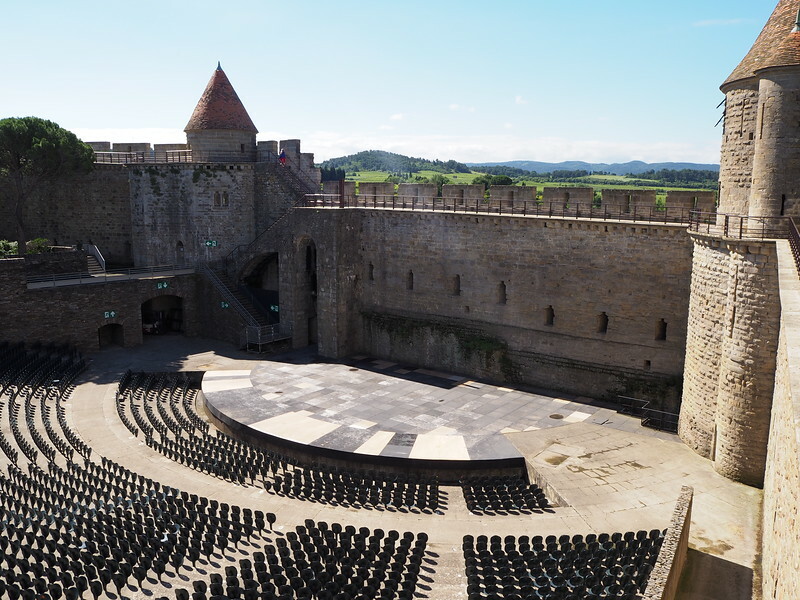 The castle’s esplanade transforms into one of the most dramatic concert venues in the UK playing host to artists such as Rod Stewart, Tom Jones, and the world-famous Military Tattoo. So, what is all the fuss about? Well to start with, historically it’s the most important stronghold in Scotland, a Royal castle has been present here since the 12th century. The oldest remaining parts of the castle are the 12th century St Margaret’s Chapel, the 16th Century great hall and Royal Palace, where Mary Queen of Scots gave birth to her son. Highlights include the Stone of Destiny (a sacred object used for the coronation of Kings), the 15th Century Scottish crown jewels, Mons Meg and the Great Hall. 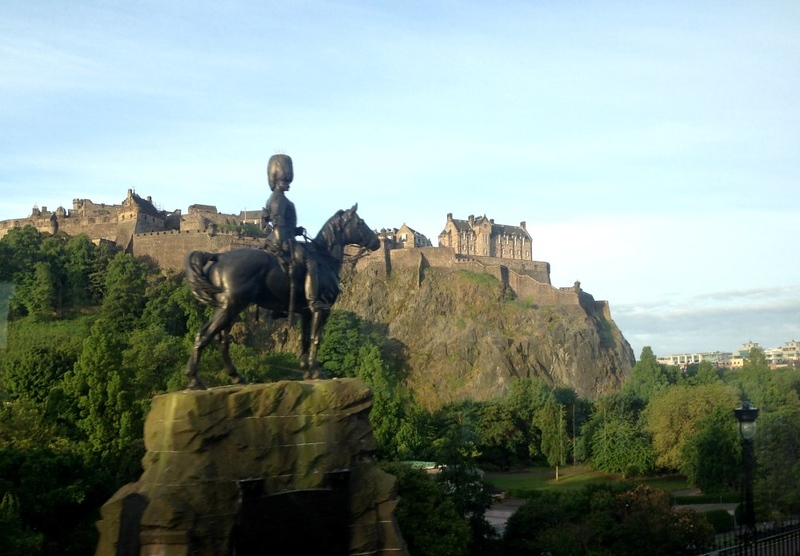 The castle is in the very center of Edinburgh with easy access from the Royal Mile. Historic Scotland and the army are responsible for maintaining and managing the castle. We strongly recommend that you buy your tickets ahead on the official website and add this special site to your Edinburgh bucket list! my favorite castle in Slovakia because it’s both spectacular and brings back fond memories of frequent visits on school and family trips. 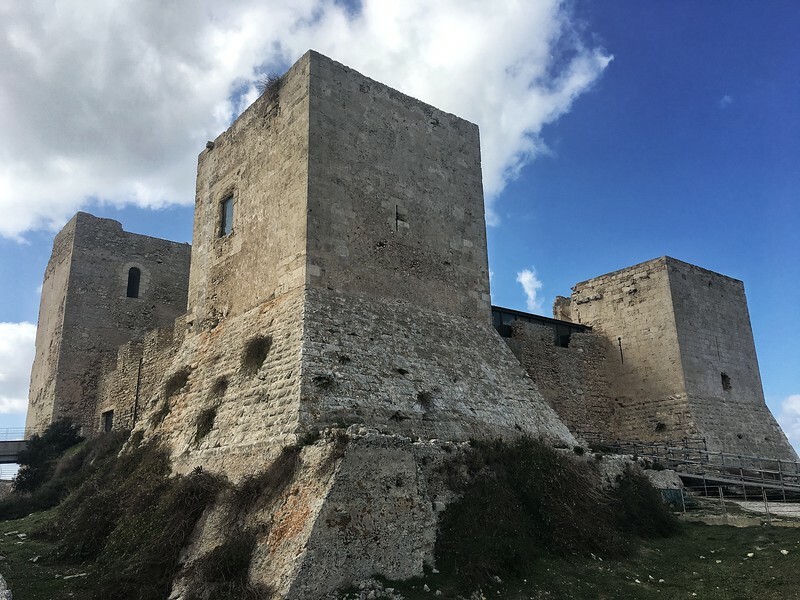 The 12th-century castle sits atop a travertine hill. First a border fortress, then expanded several times, particularly in the 14th century, it was a longtime power center of the rich Spiš region. One of the Hungarian kings was born here. 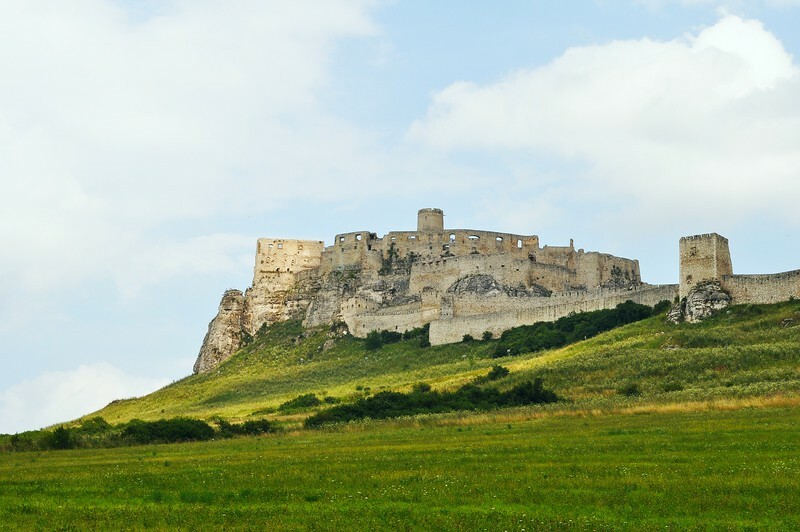 After a big fire destroyed it in 1780, Spiš Castle fell into ruin until the 1970s conservation. The museum located here showcases the castle’s history, historic weaponry, and feudal justice practices. Night tours are very popular, and reenactments and performances draw big summer crowds. 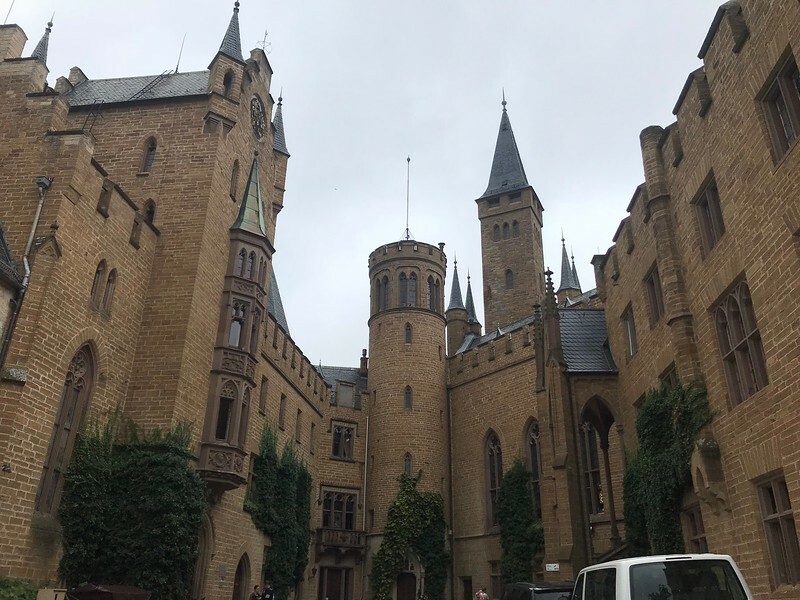 When I lived in Magdeburg, Germany I visited the beautiful Schloss Wernigerode in the Harz mountains, and it has since become one of my favorites. 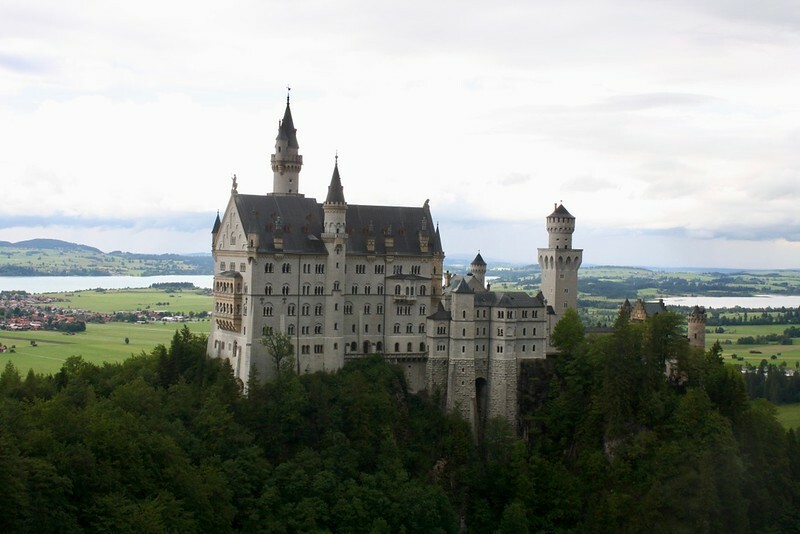 Similar in style to Bavaria’s Neuschwanstein, albeit smaller, this baroque style castle was once a medieval fortress. 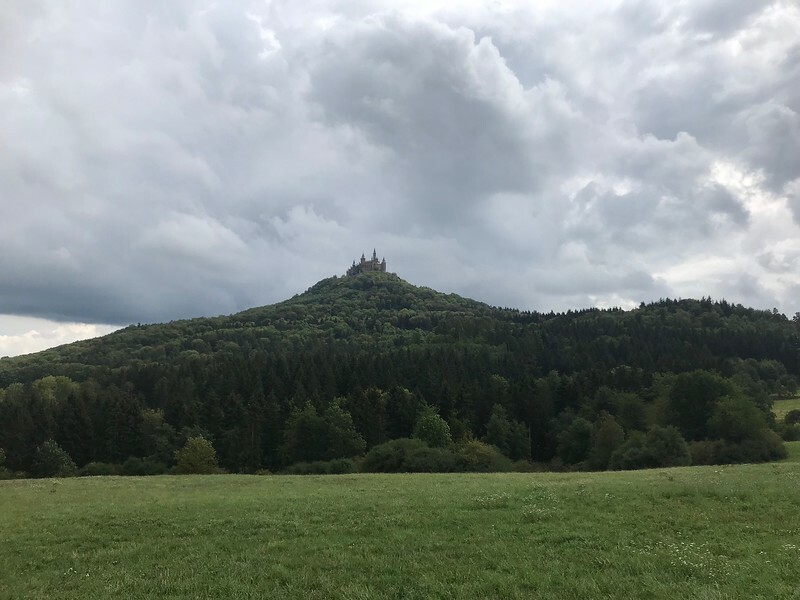 A little over 1 mile/2 km from the Wernigerode train station, you can easily reach the castle by foot. If you’d rather not walk up the hill to the castle, you can hop on the cute Bimmelbahn tourist train. 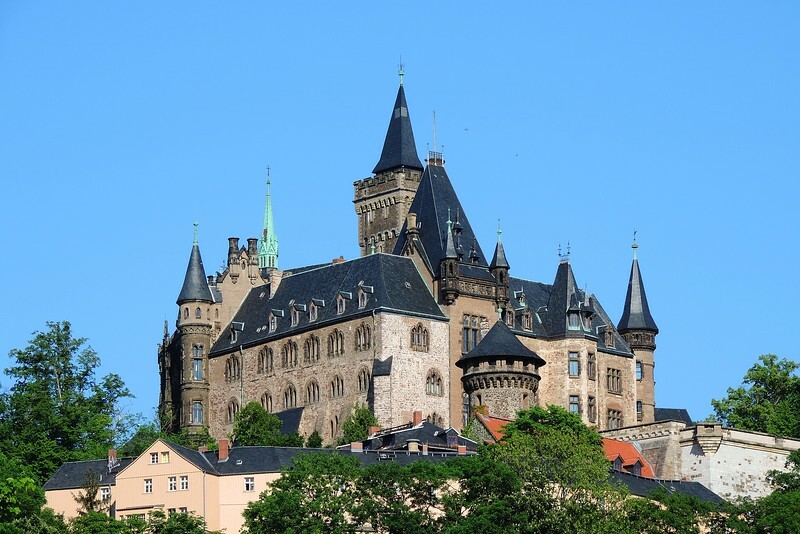 Once at the top, be sure to enjoy the stunning view of historic Wernigerode below! There are a couple different tours you can choose from in order to explore different parts of the castle, and there are discounted rates for kids and families. Once you’ve had enough of the castle, be sure to walk back down to the town center and take in the beautiful half-timber buildings in the market square. Quite a collection of amazing castles…how many of you have visited all 50? I can’t imagine there are many out there so plenty of inspiration for sure as you plan your next European adventure! I know we are excited about exploring many of these. I want to thank all of our amazing friends from around the world for sharing these gorgeous castles. With so much history, heritage and spectacular architectural design, these castles are the “Best of the Best” when it comes to Europe’s finest structures. Which castle do you think should be number one on everyone’s list? In our opinion, there is no best castle as each one has something unique that makes it so amazing! Previous articleWhy Fjallsarlon Glacier Lagoon is an Amazing Natural Attraction? This is the ultimate list, thank you so much! I can’t wait to check them all out! Thanks so much Julie, this post turned out so well and we too have so much inspiration on European castles that we need to visit!! “Spis Castle” reminds me of Game of Thrones. 😛 Thanks for sharing.